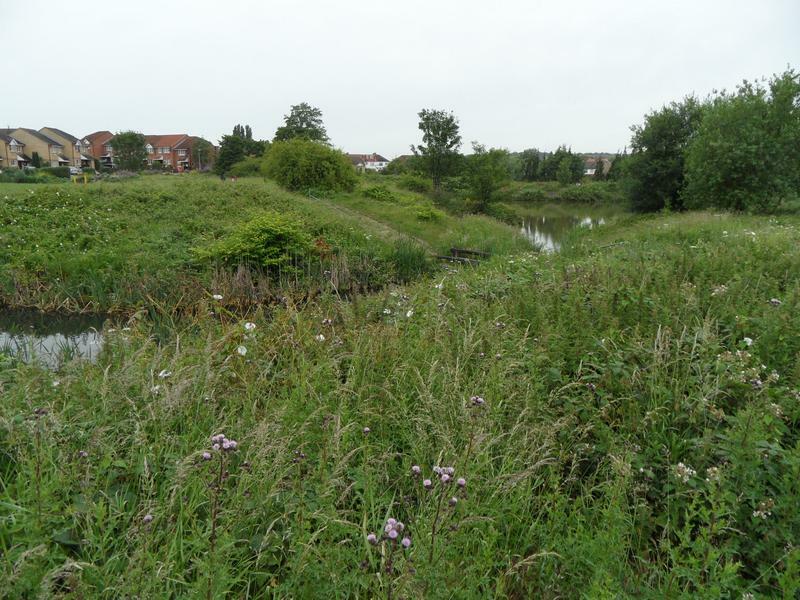 from other roads, including Anthony Road (off Morland Road) and Tennison Road (but not Birchanger Road to the west), no gates. 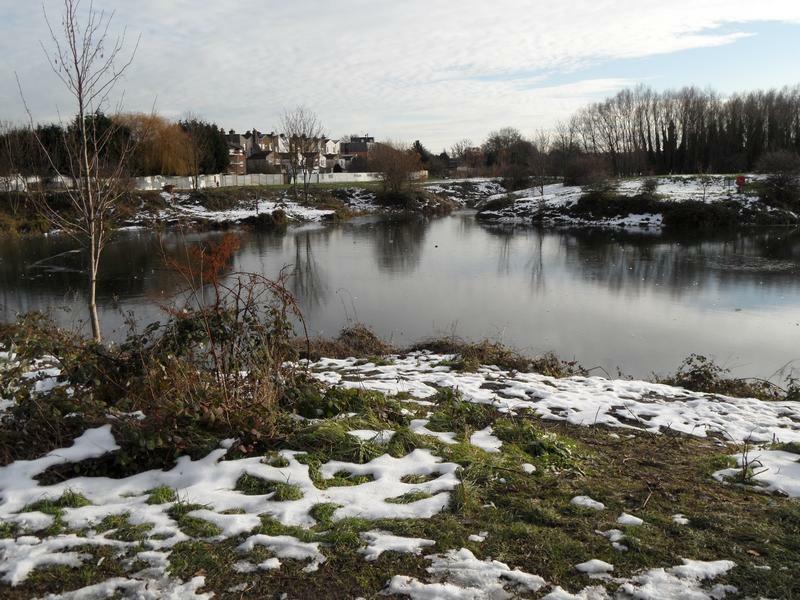 The main pond in Brickfield Meadow during the winter. 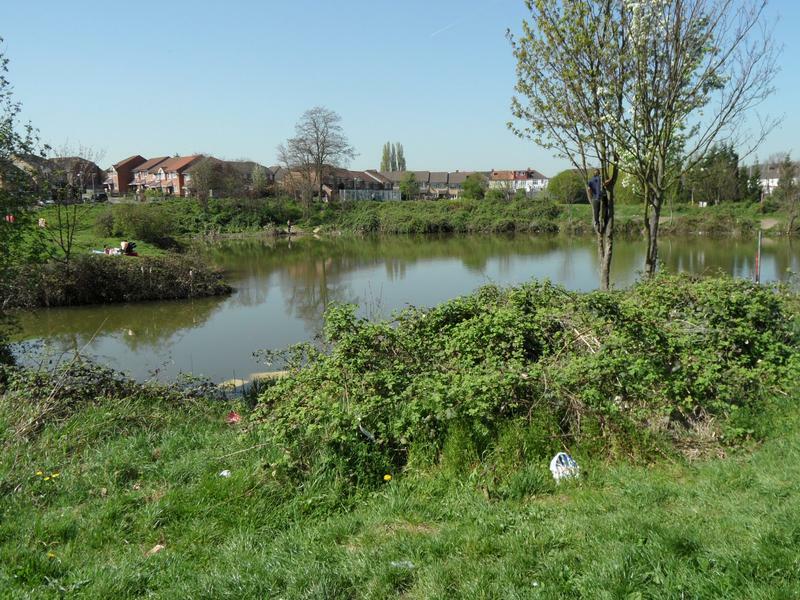 A few weeks later, another view of the main Brickfields Meadow pond. 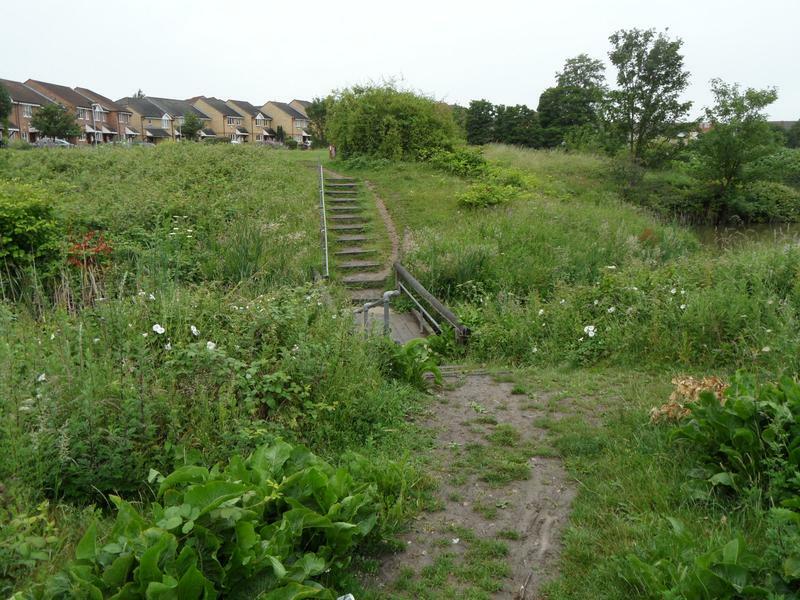 with the steps down to the bridge. 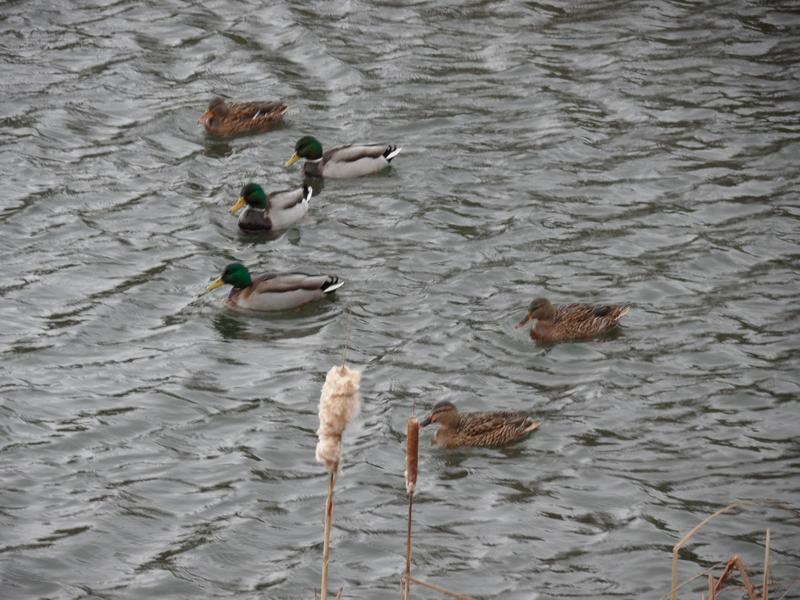 January 2011, three pairs of Mallards on the main pond. 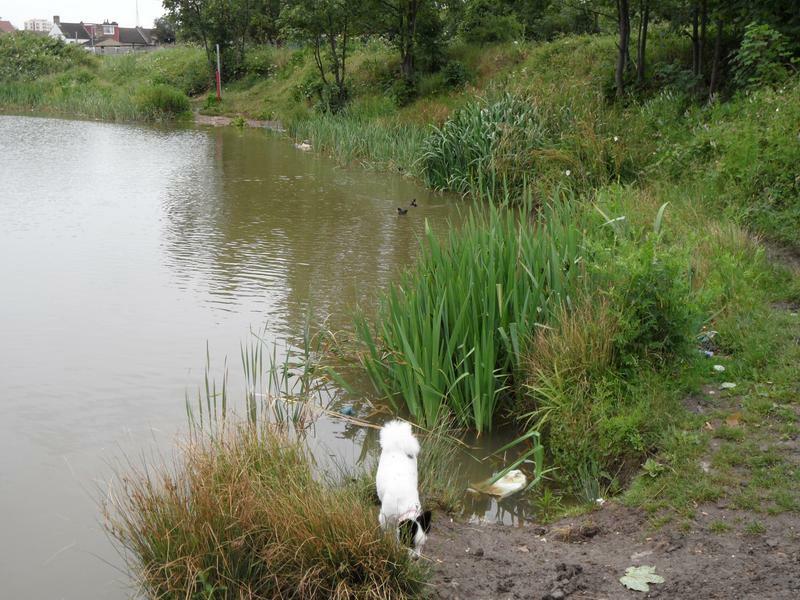 One corner of the main pond, Lucy watching a pair of Mallards, with some Coots in the distance. 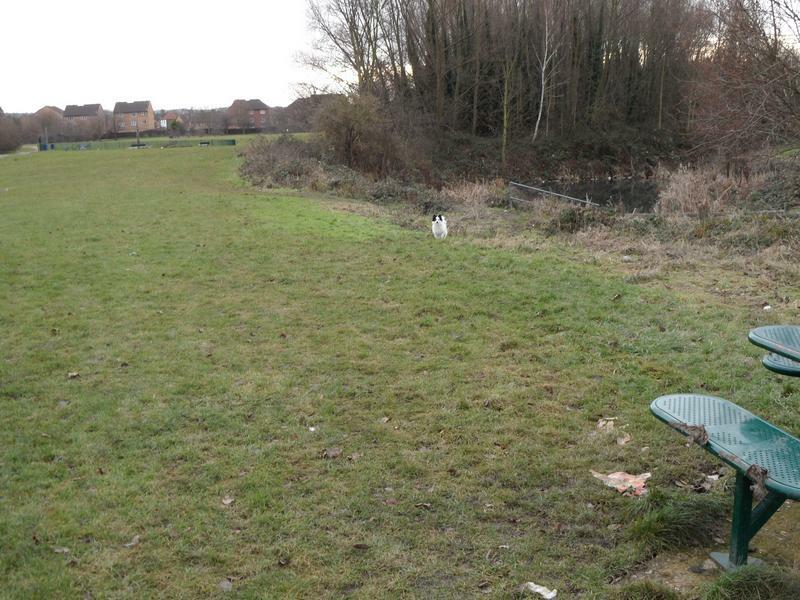 Rather a lot of rubbish as well. 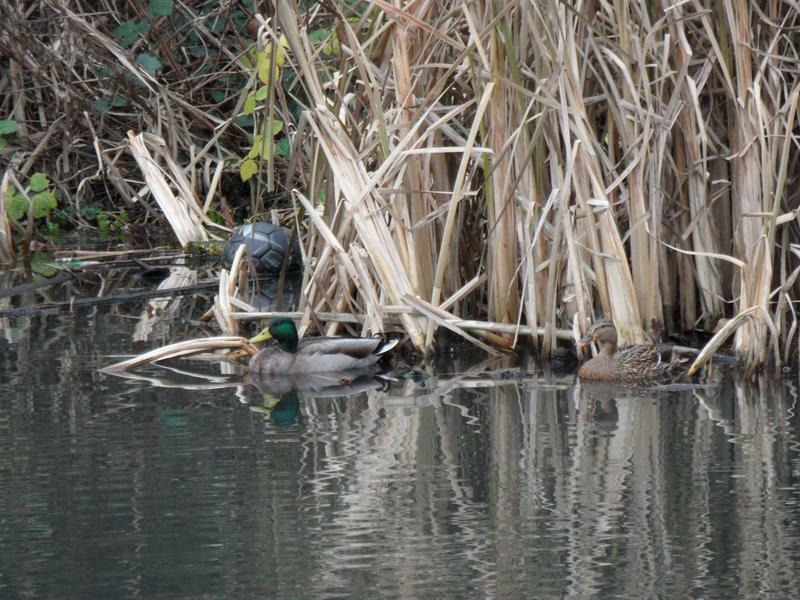 February 2011, one more male Mallard has arrived, Moorhen at the back. 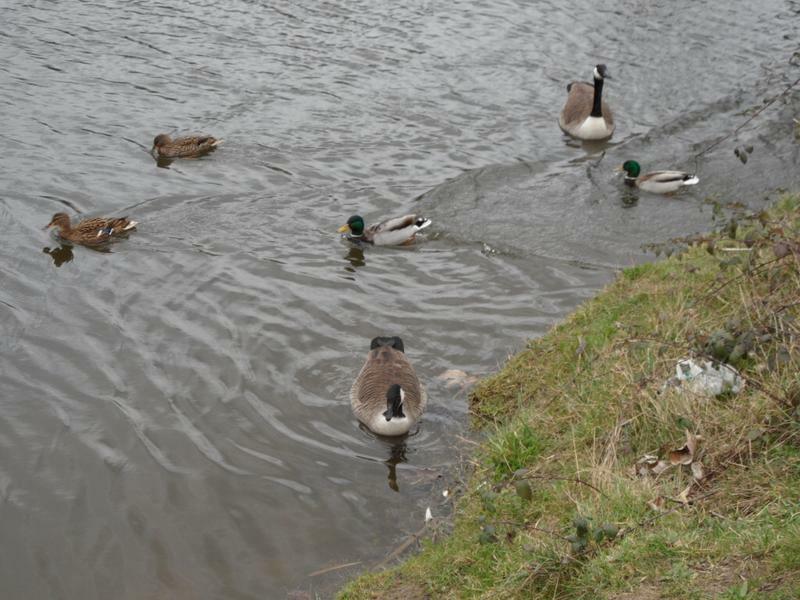 The geese eating some bread, ducks on the water. 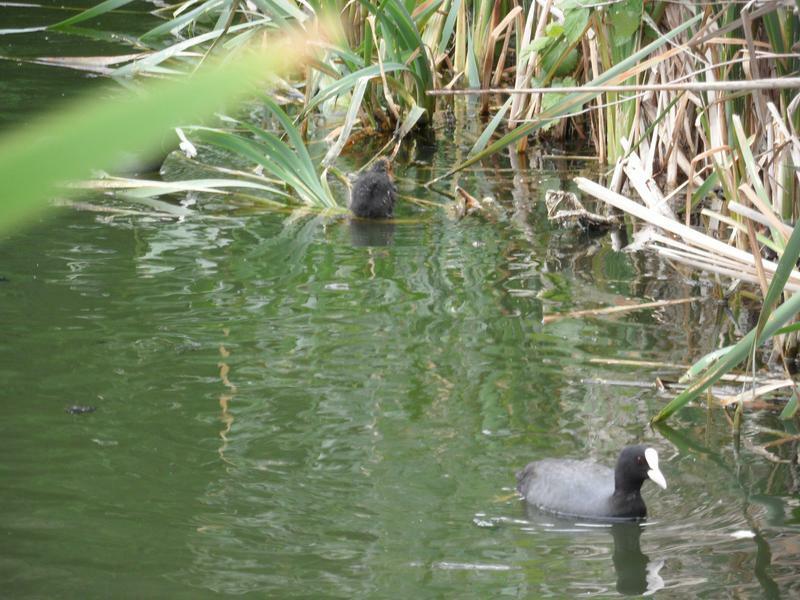 A pair of Coots on the water. 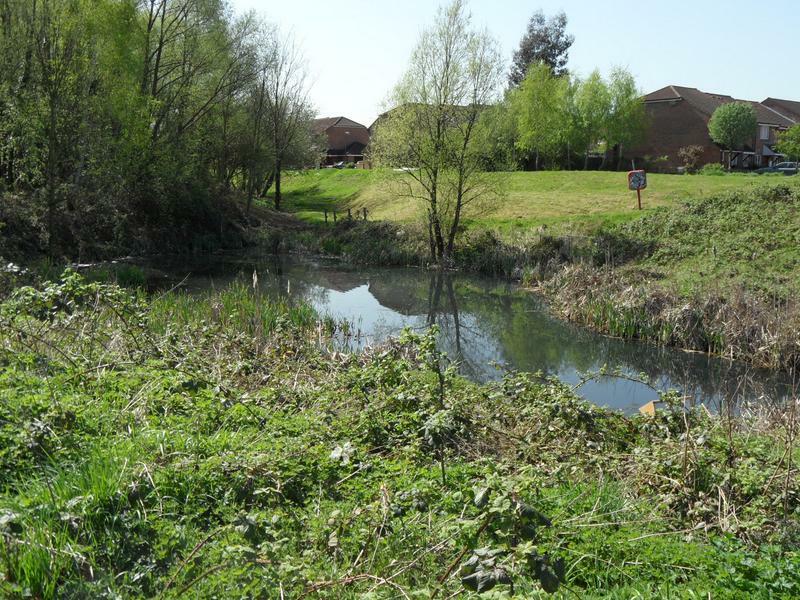 March 2011, one pair of Mallards has left the meadow, might be in my garden. 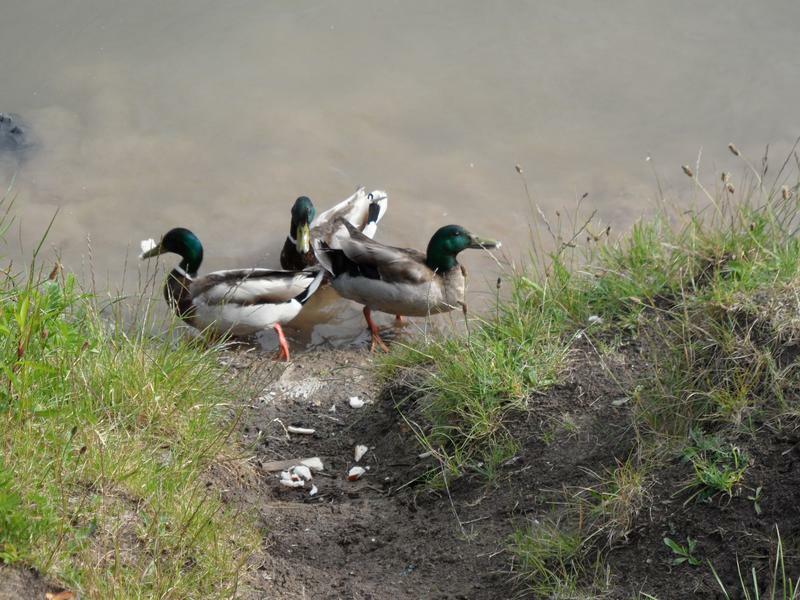 And now just one pair of Mallards left, this is a popular fishing beach. 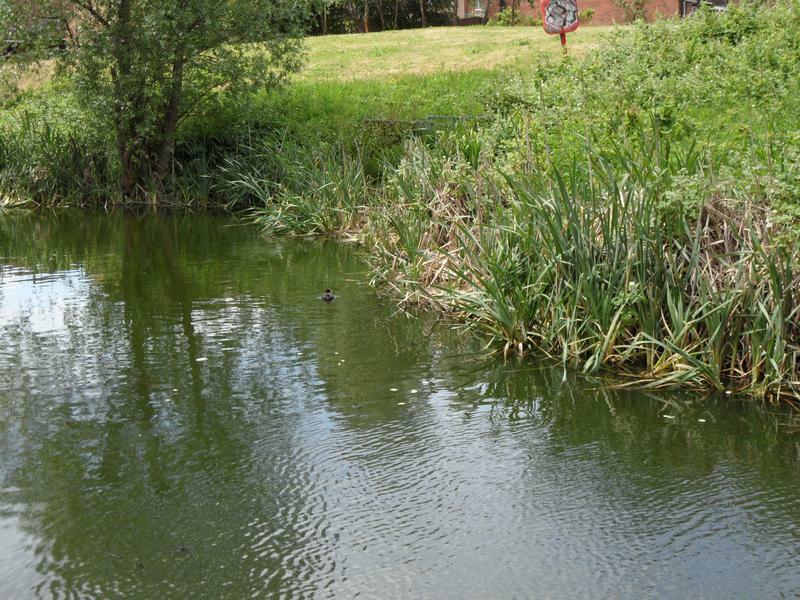 The smaller pond at Brickfields Meadow, no fishing here so quieter than the main pond, the Coots and Moorhen seem to live here. 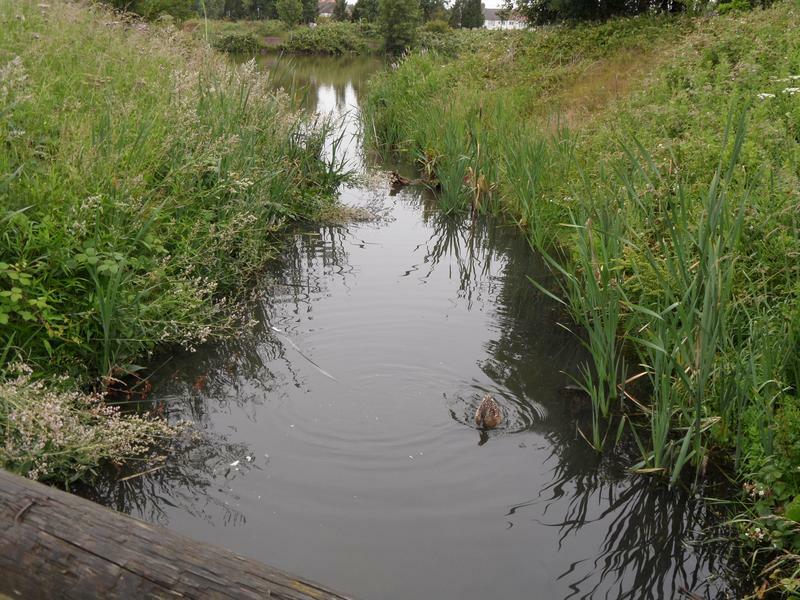 all dried out and cracking. 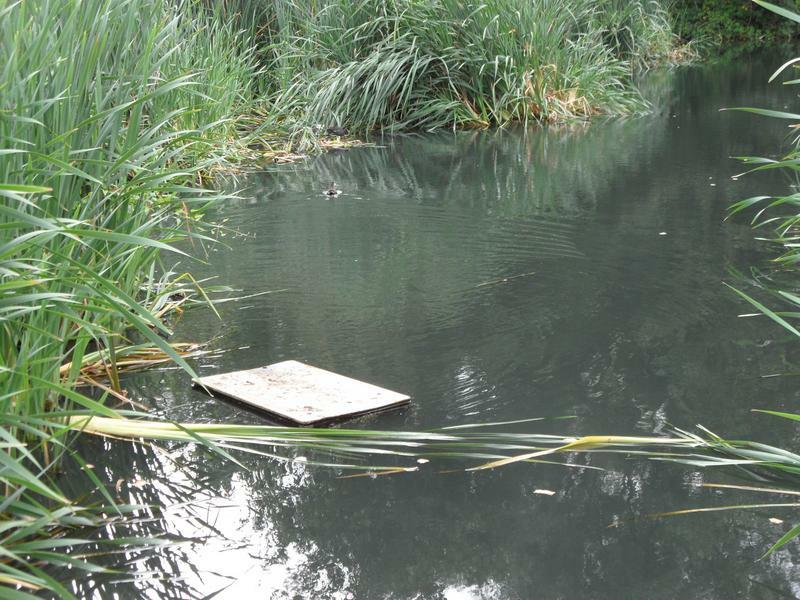 Lucy has just been paddling. 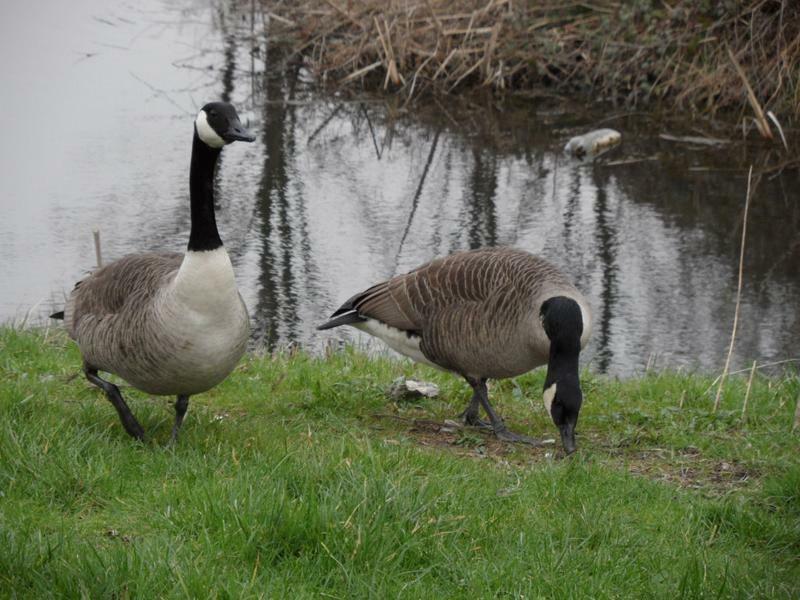 Still one pair of ducks and geese. 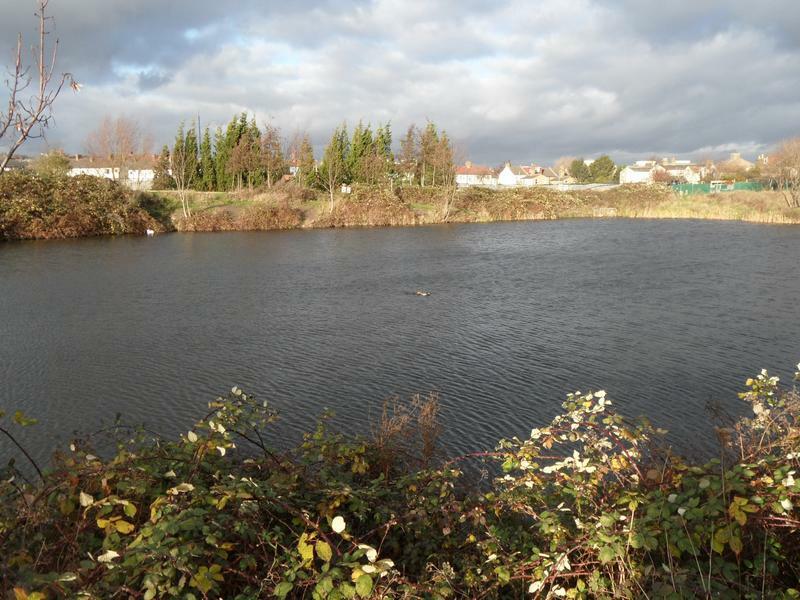 Looking across the main pond, the small pond beyond the inlet on the far side. 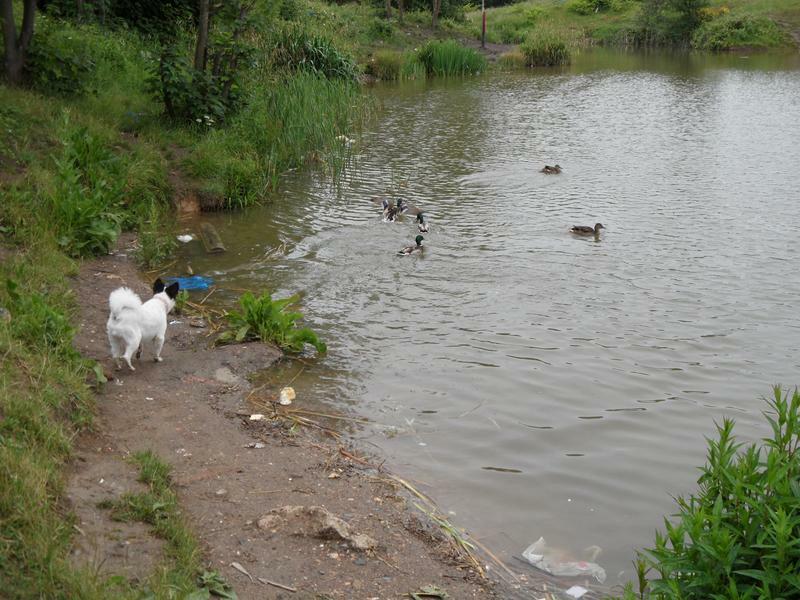 The inlet on the far side, another fishing spot that is ideal for dog paddling, which leads to a low bridge and the small pond. 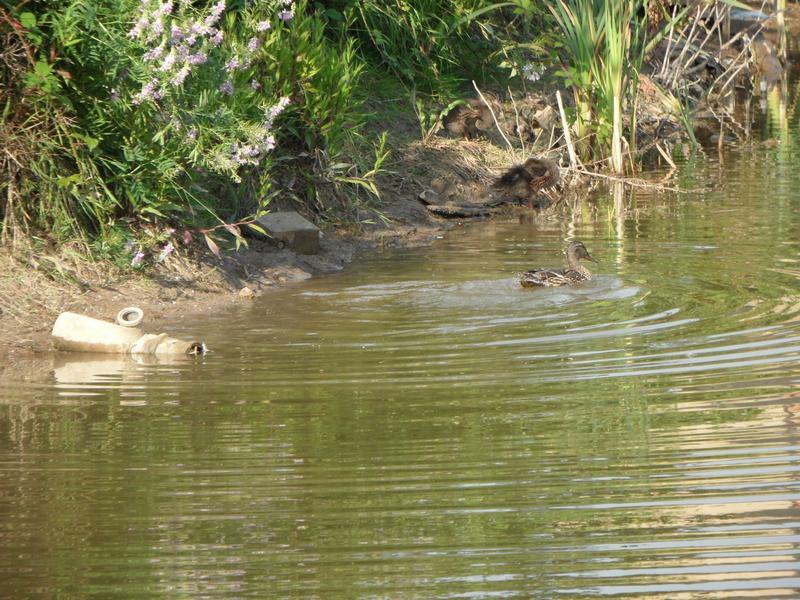 the duck is laying a nest of eggs in the pond inlet, because she has ducklings in late May. 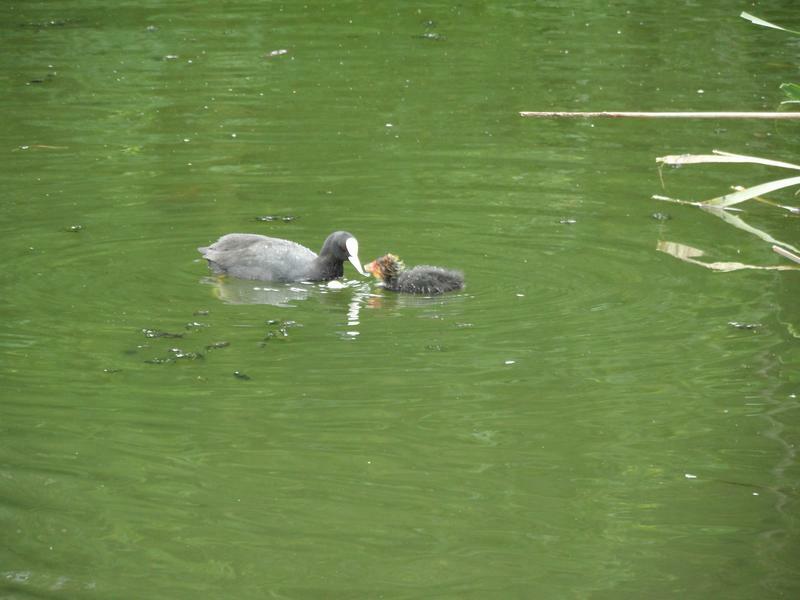 22nd May 2001, a Coot feeding her youngster. 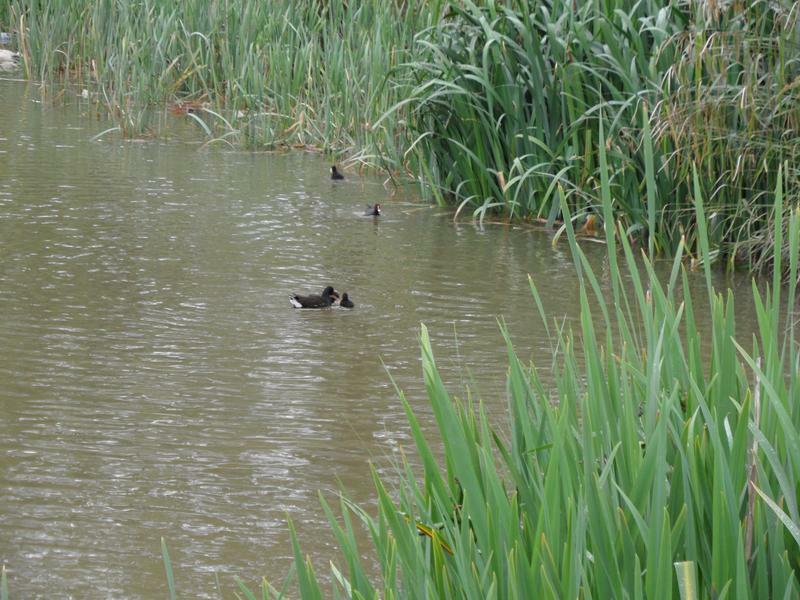 The Coots are nesting in the reeds of the small pond, but do move to the main pond as well. 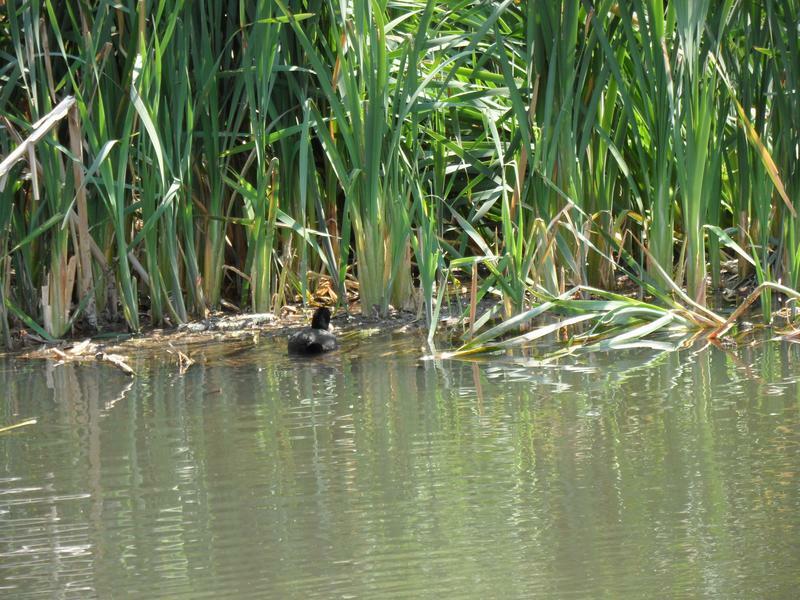 The Coot nest on the right edge of the photo in the reeds. 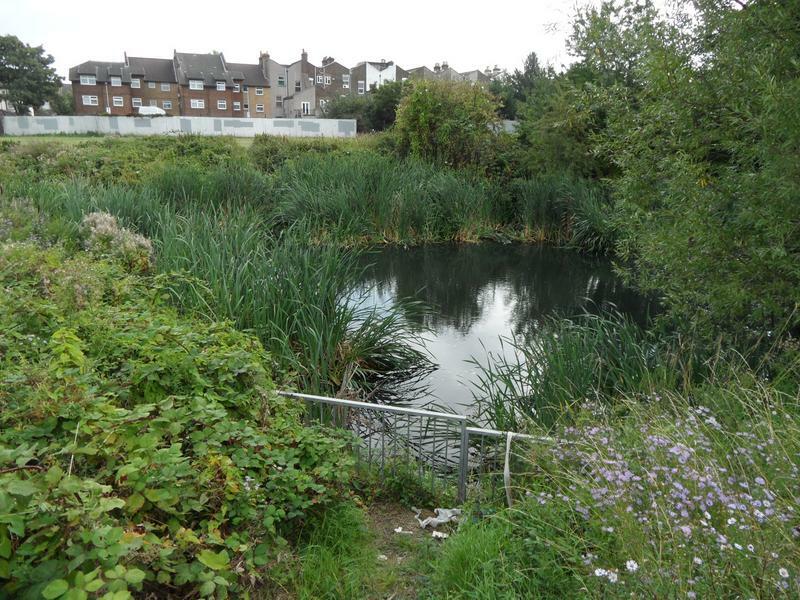 Wider shot of the small pond. 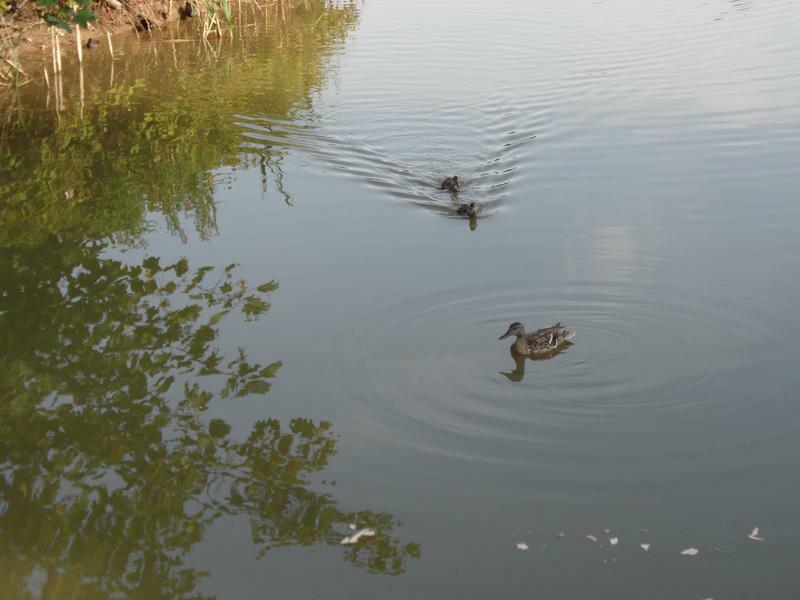 and stay away from water fowl. 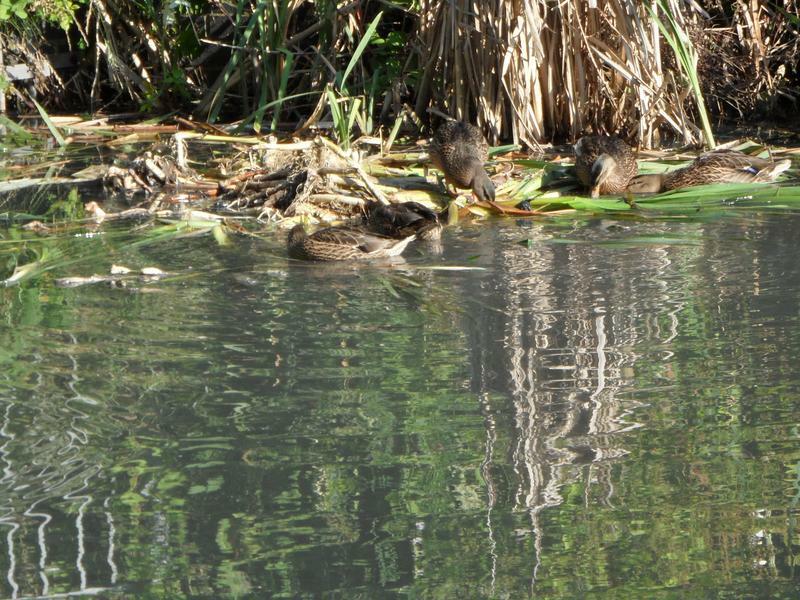 weeks old, so missed them during May visits to the meadow, they may have been sleeping in the reeds. 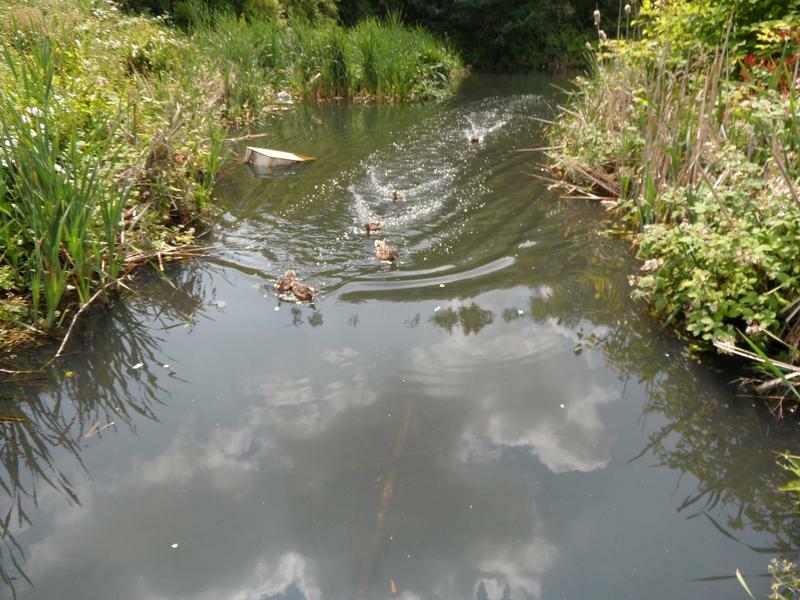 Heading off back into the small pond, which needs a good clean up of dumped rubbish. 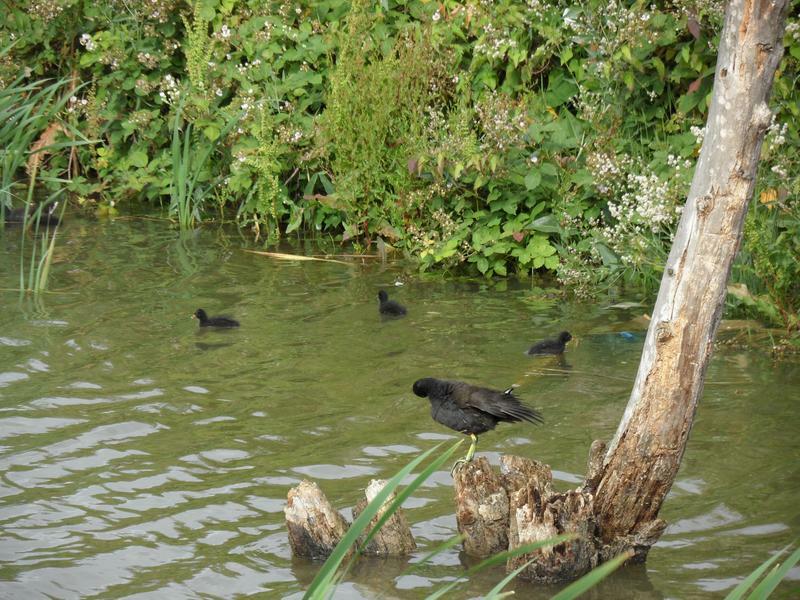 Coots in the background. 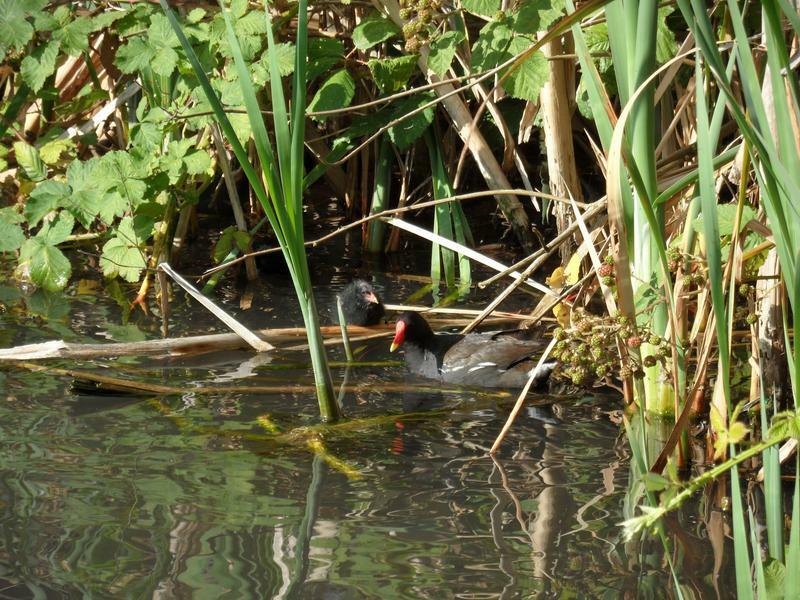 An adult Coot, no sign of the youngsters, hope the Mallards have not moved them out of the pond. 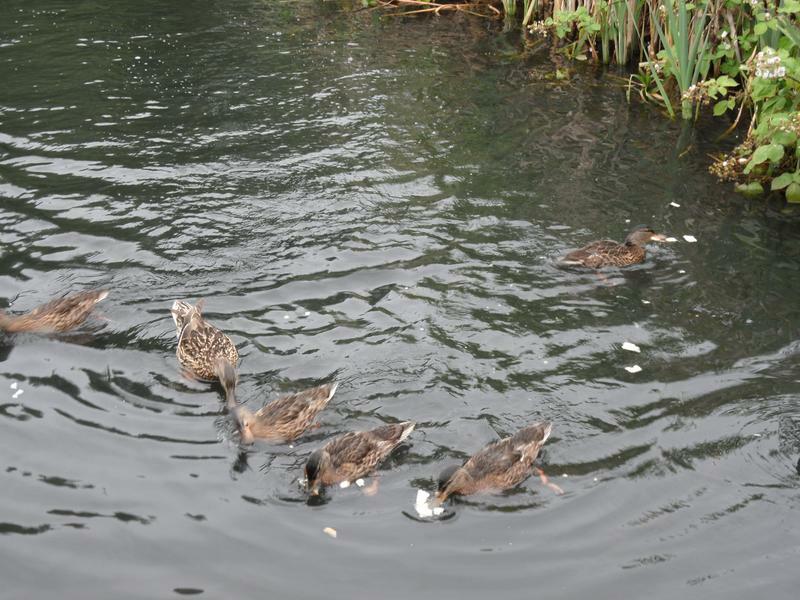 10th June 2011, the boys tend to hang out together, leaving the female to look after the family. 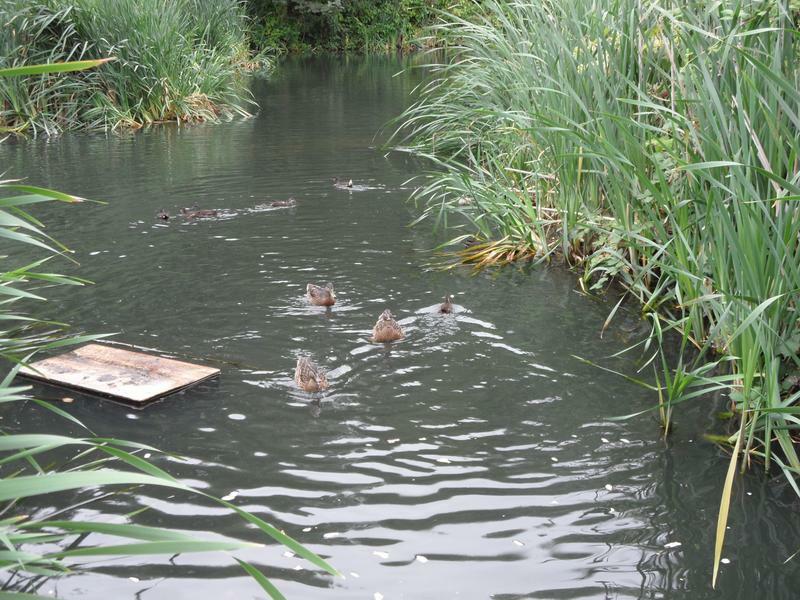 Early morning, there is no fishing so the ducklings are back on the large pond. 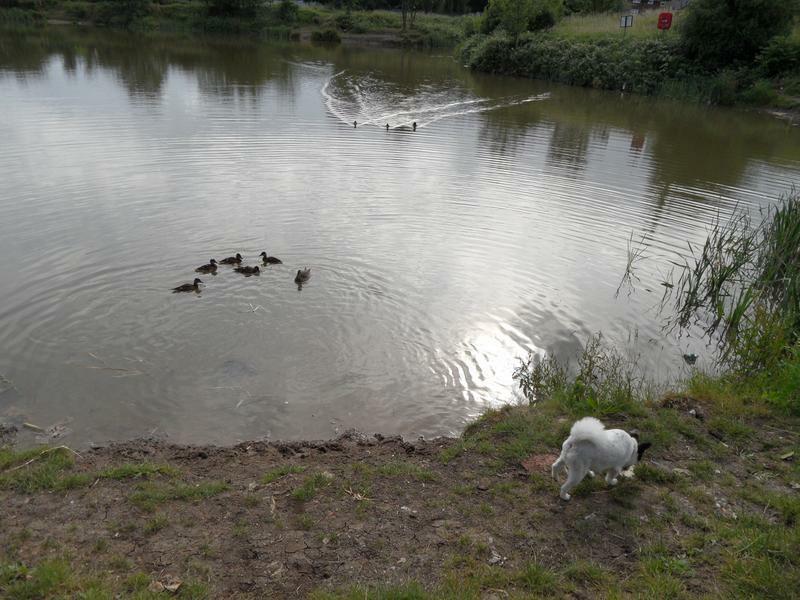 And three three boys have decided to join the family for more bread, watched by Lucy. 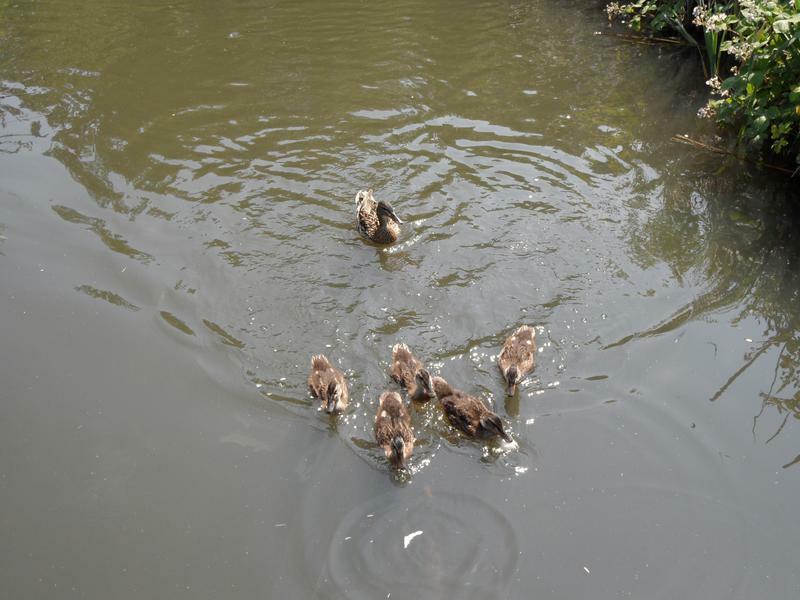 Feeding time for the family. 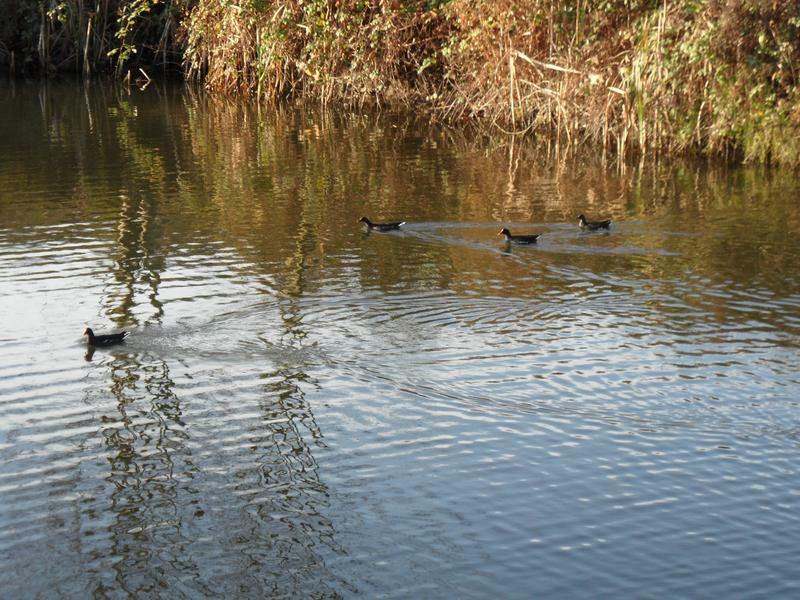 The boys have returned to their small beach, but a hungry Moorhen has joined them looking for food. 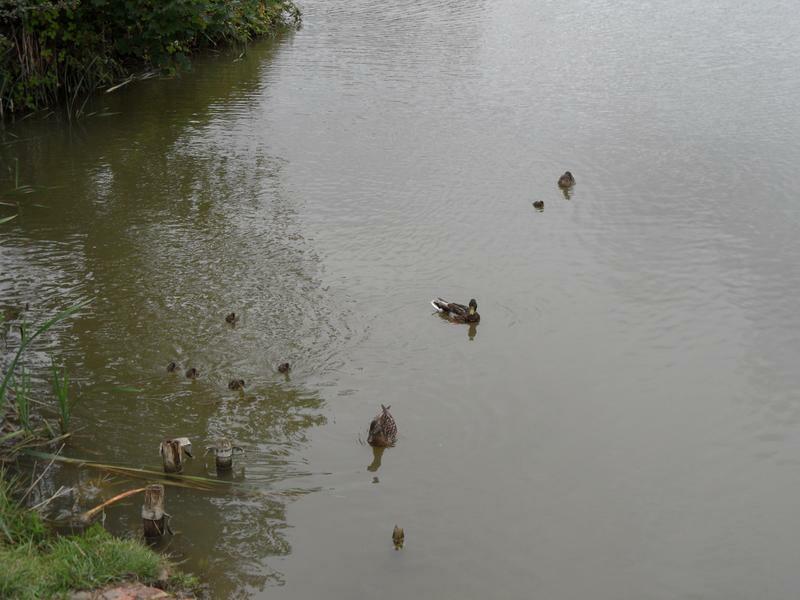 Mum and dad just watch the young ducks eat. 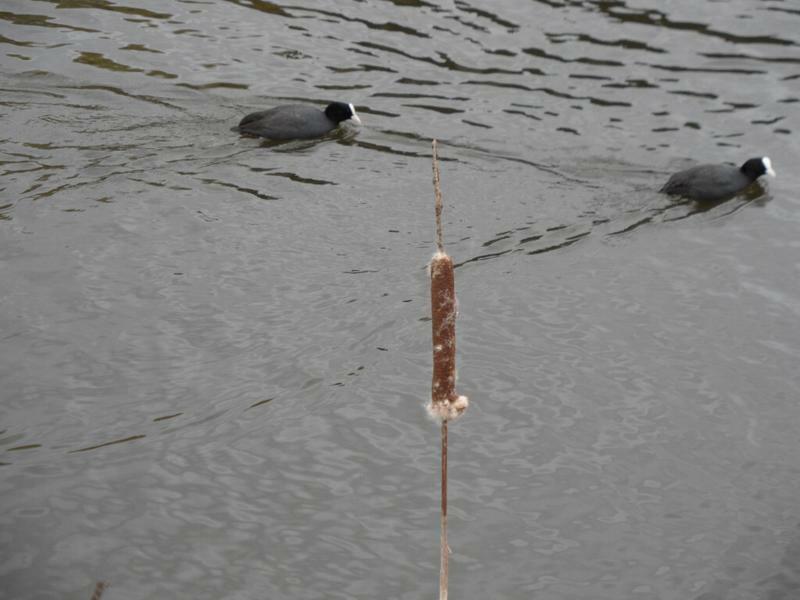 And finally they all disappear to the reeds. 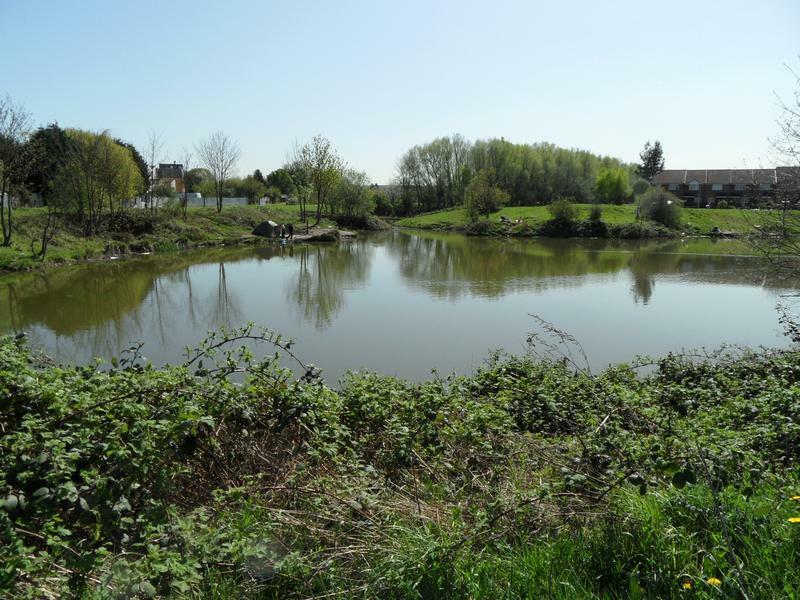 the large pond at the top right. 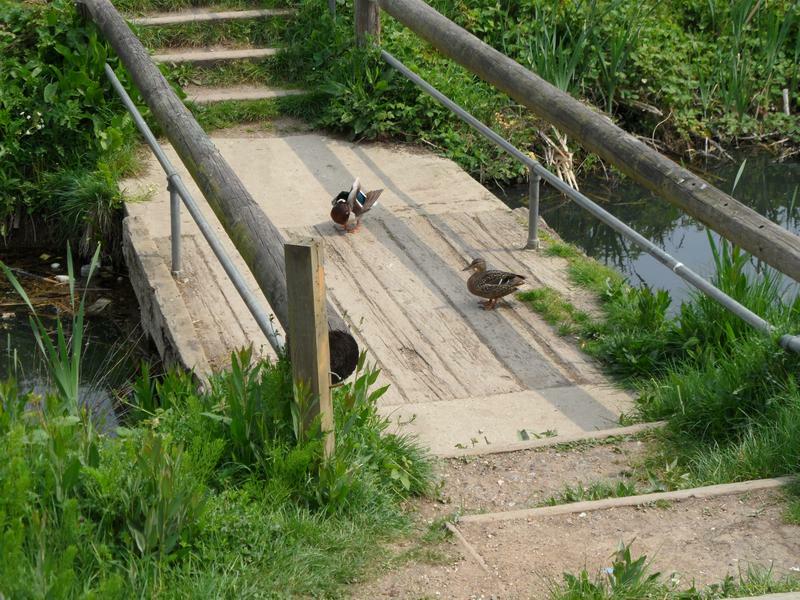 The steps up and down to the small bridge between the two ponds. 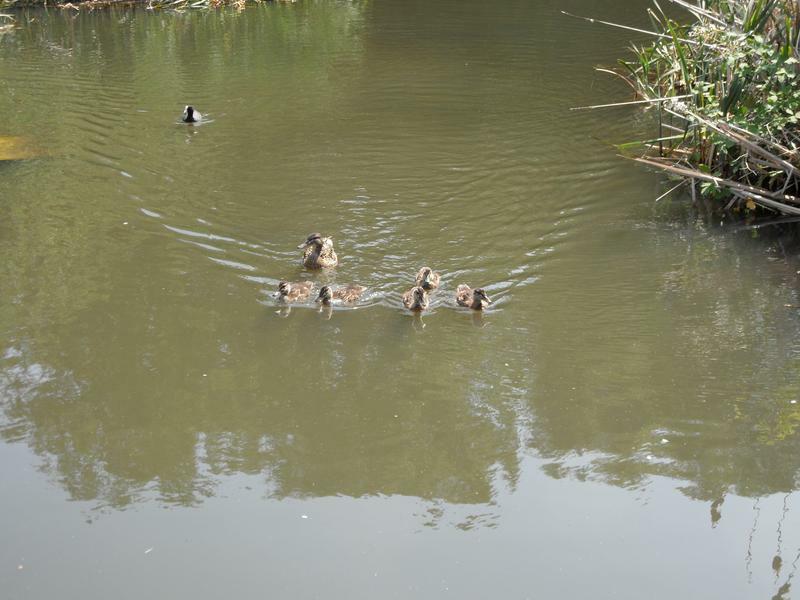 the pond, followed on the water by her young ducks who can not yet fly. 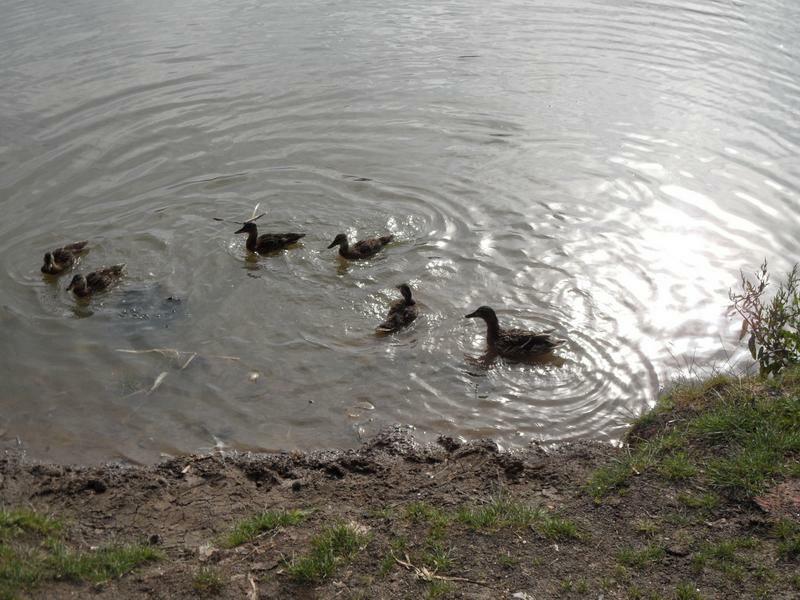 The young ducks having breakfast, they look about six weeks old. 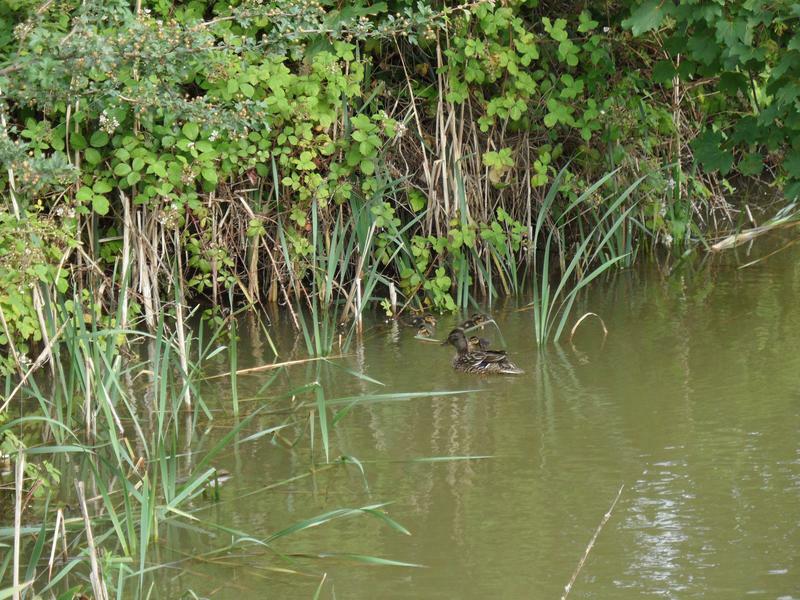 we discover she has two ducklings, they must still be in the nest here. 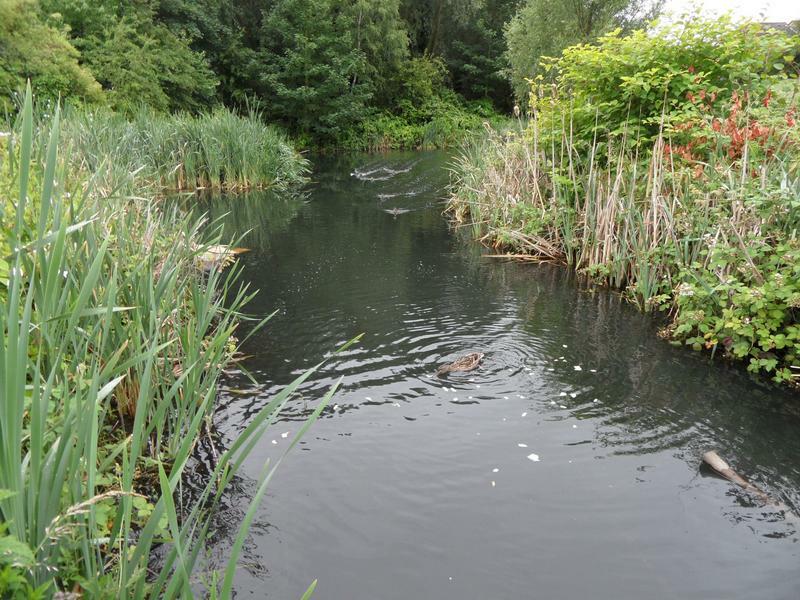 appeared out of the reeds. 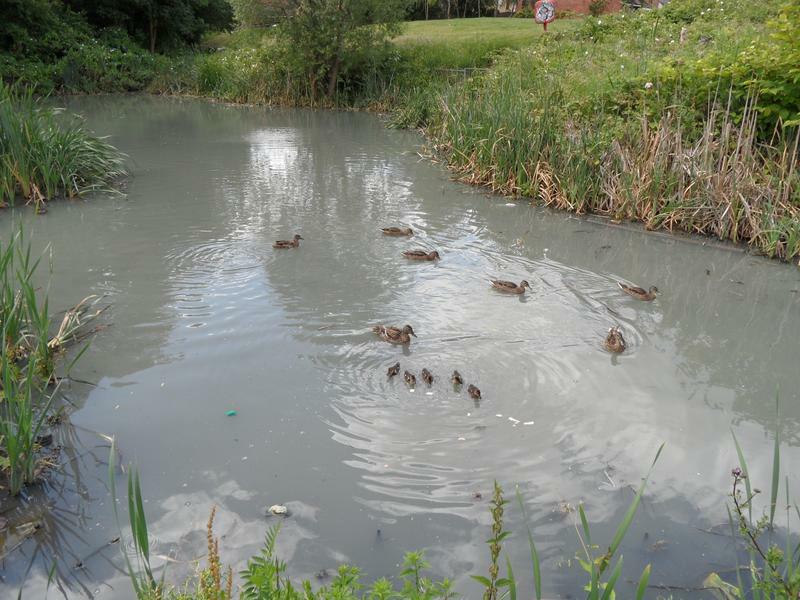 They are very timid and keep disappearing back to safety. 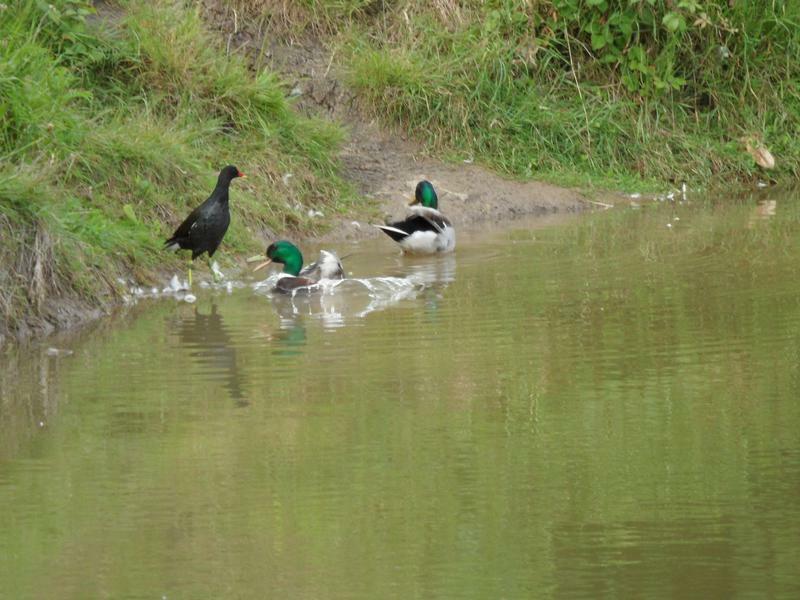 The Moorhens in the background, Lucy getting covered in wet clay, it's been raining for days. 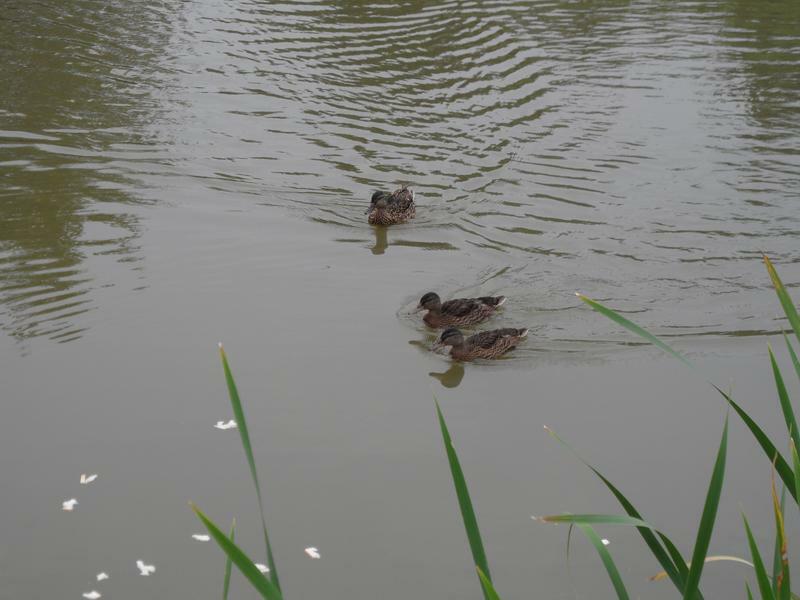 There now seem to be three pairs of Mallards on the pond again, there are more nests somewhere. 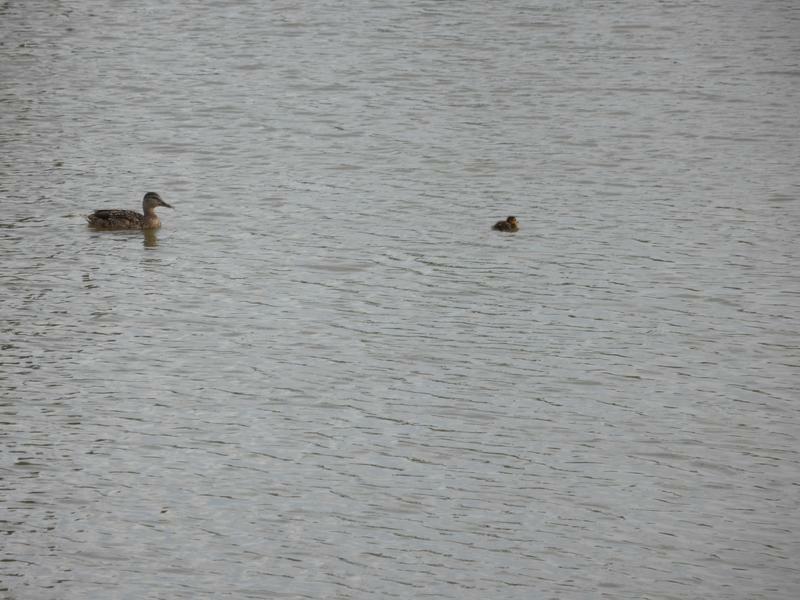 19th May 2011, the Mallard family swimming fast across the water looking for food. 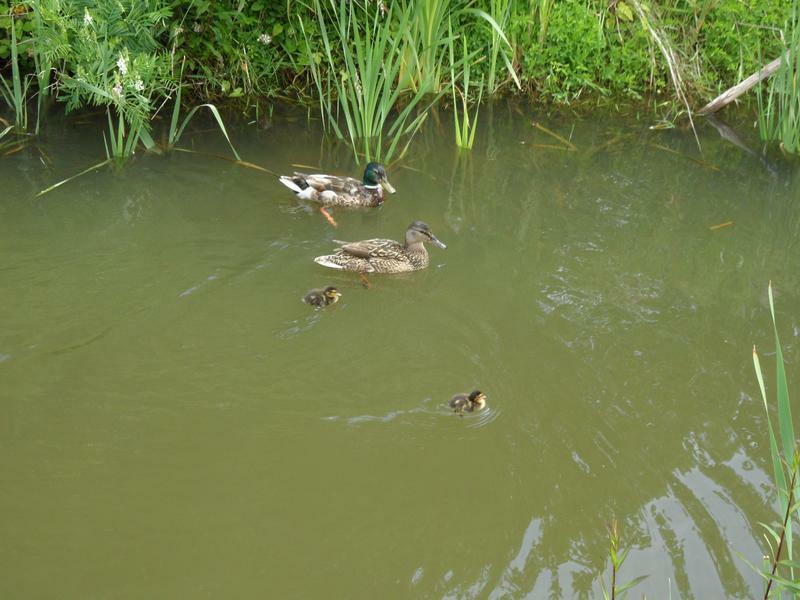 A second Mallard family on the main pond, just two ducklings probably only a few days old. 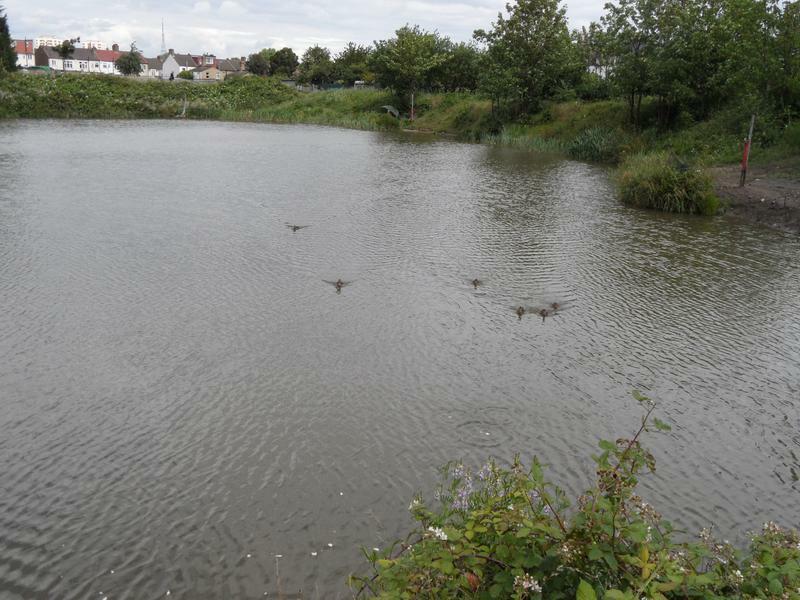 Ditto, swimming down the inlet toward the bridge. 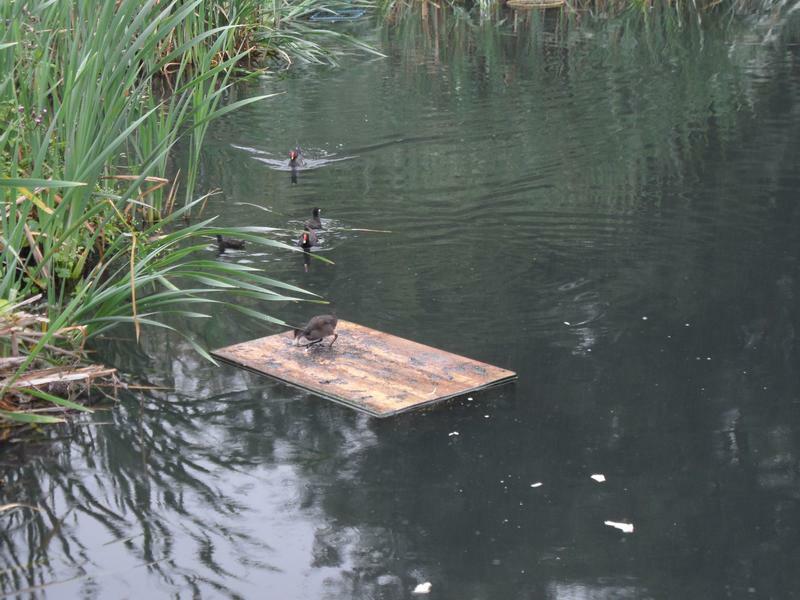 In the main pond, the Moorhen seems to have moved her family to the opposite side of the pond, away from the fishing. 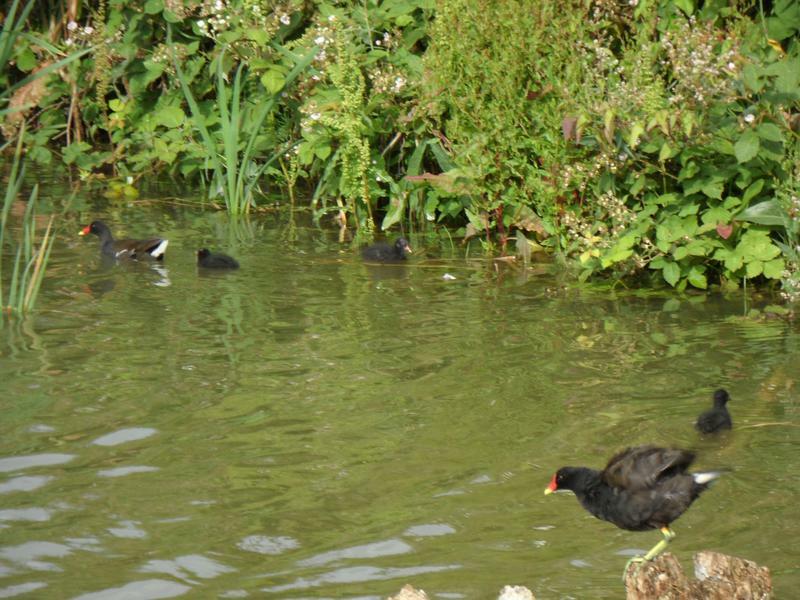 The Moorhen family by the edge of the pond. 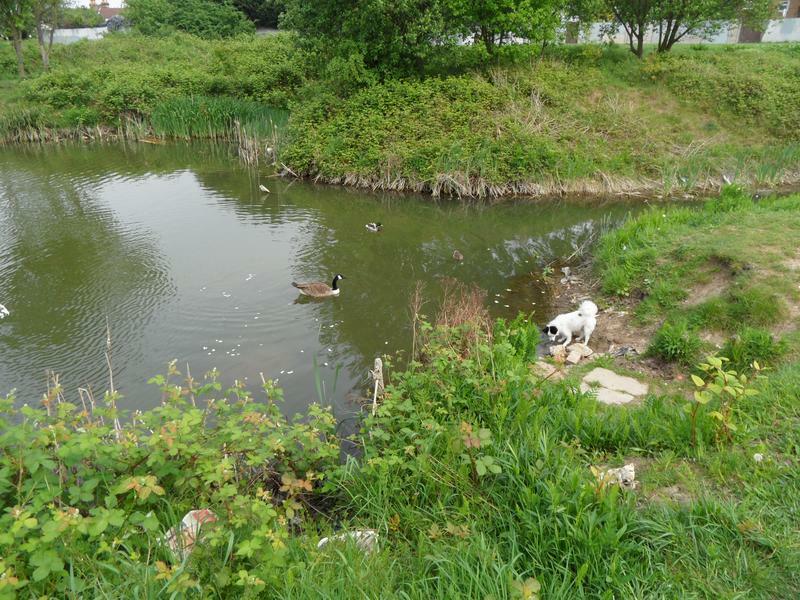 in the pond, but easy for people to feed them. 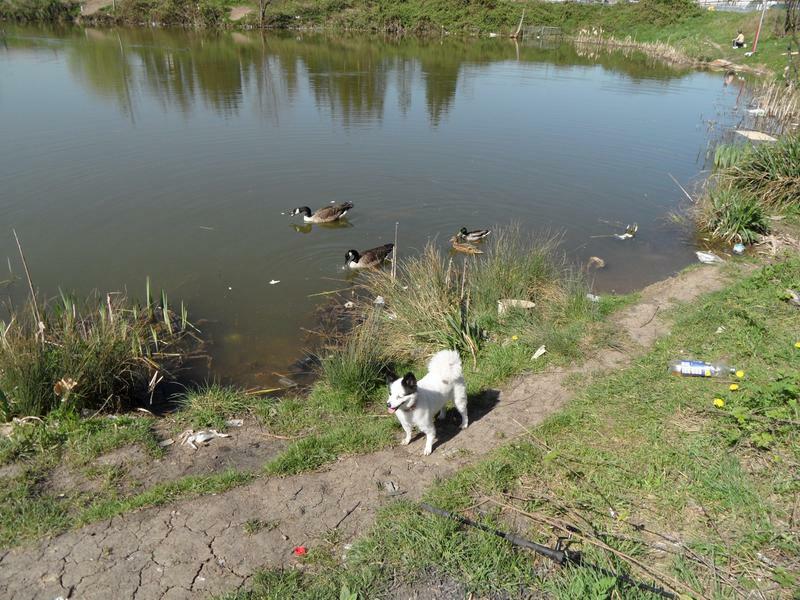 and she has to follow to the bank. 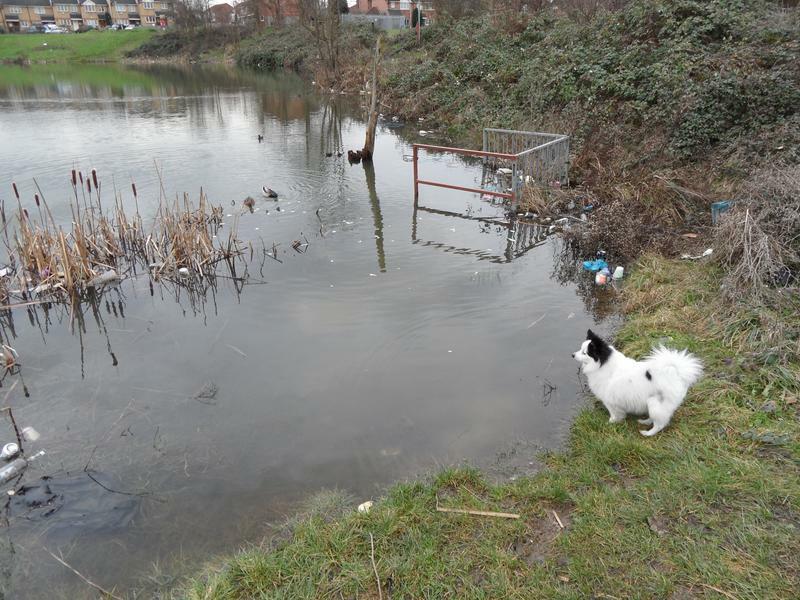 Her second duckling must have died. 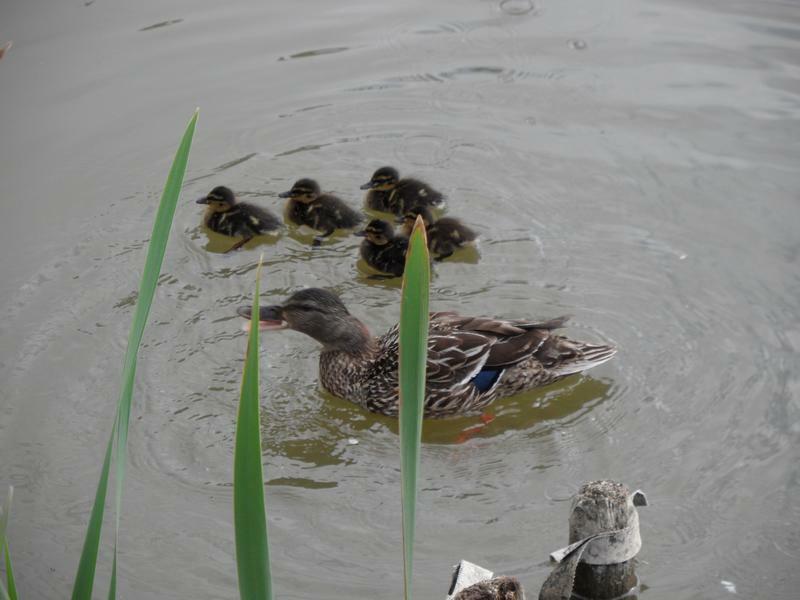 A third mallard with five ducklings, a few days old. 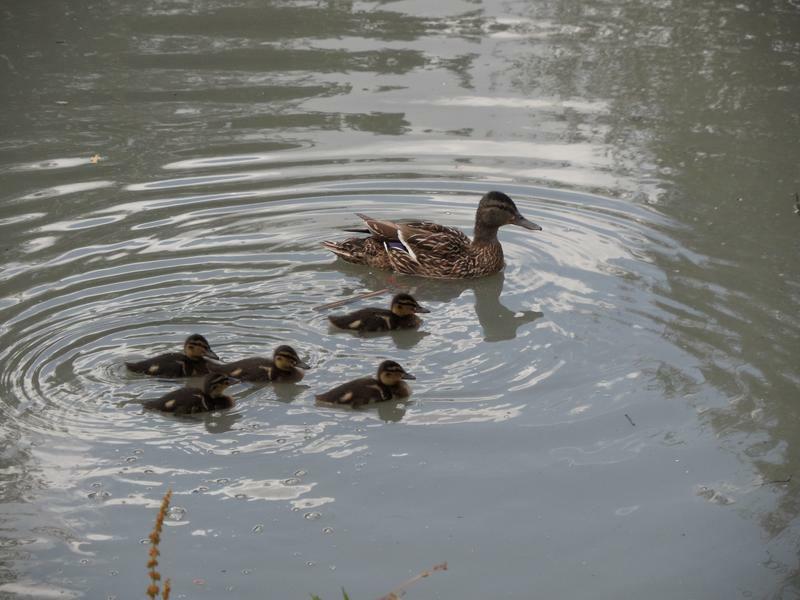 The third mother herding her ducklings back to the safety of the plants. 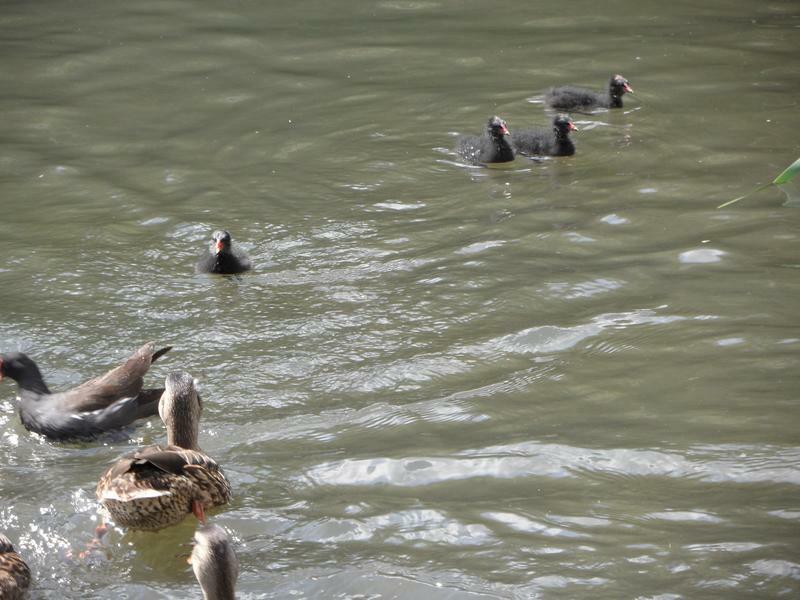 23rd June 2011, the Moorhen family, parents and at least three youngsters. 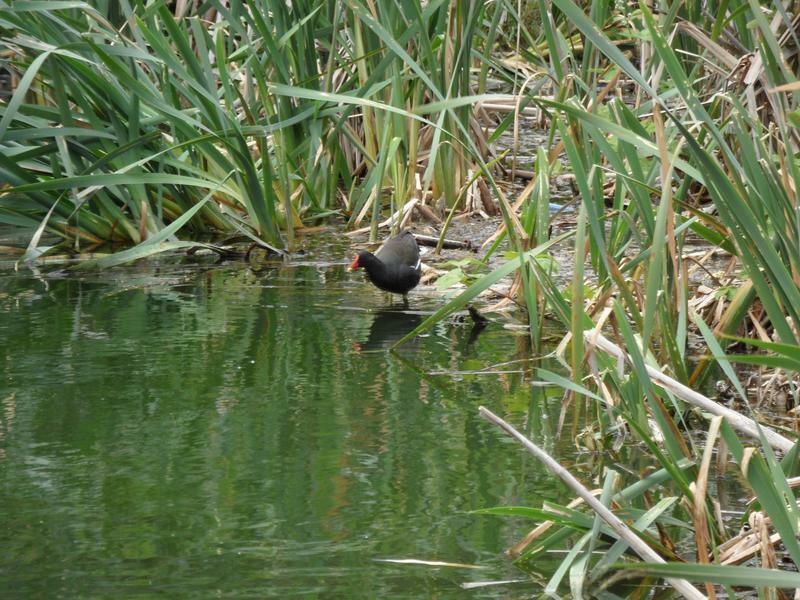 The Moorhens are usually difficult to photograph, but conveniently at the corner of the pond. 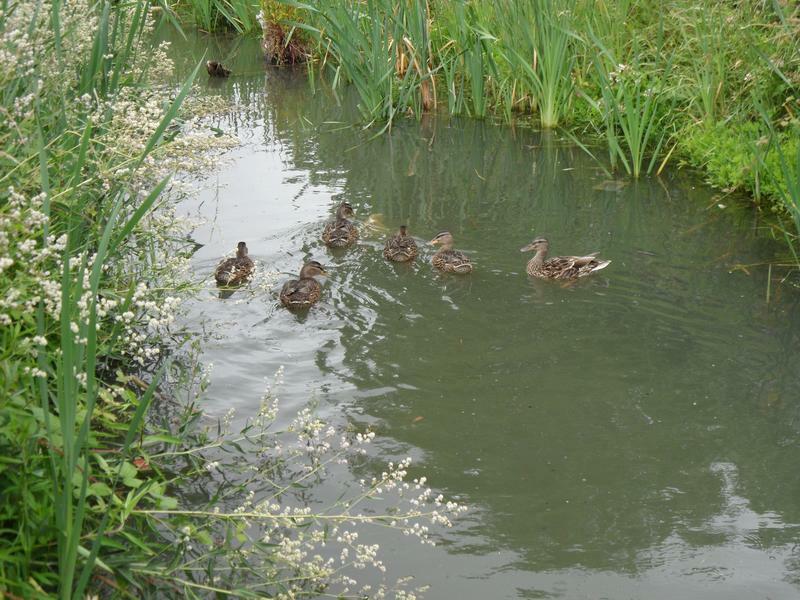 25th June 2011, the second and third Mallard families, the first family is around the corner. 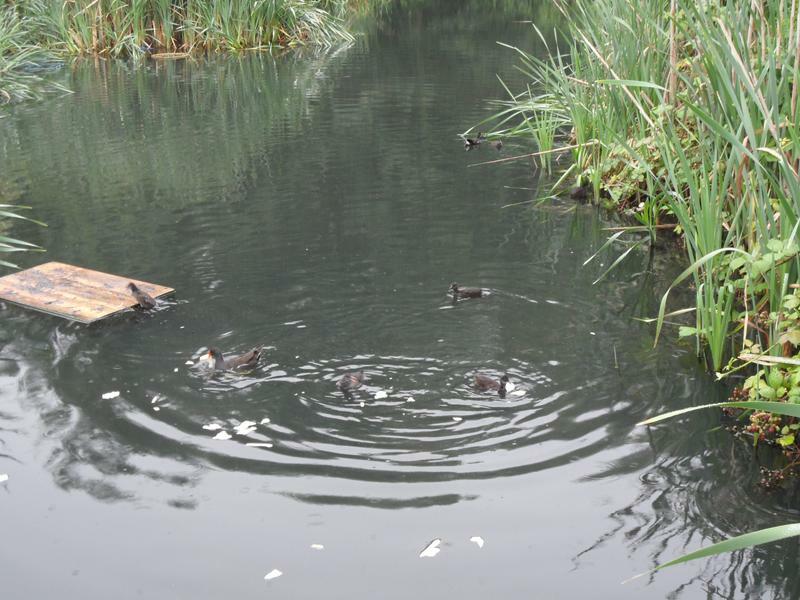 six or seven weeks old. 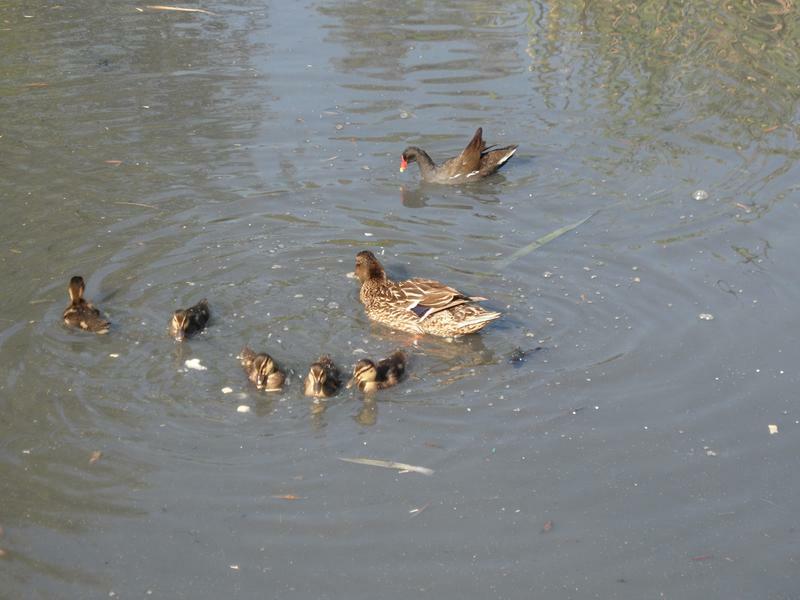 foreground is the second mother but now without any ducklings, or maybe the two families are now one. 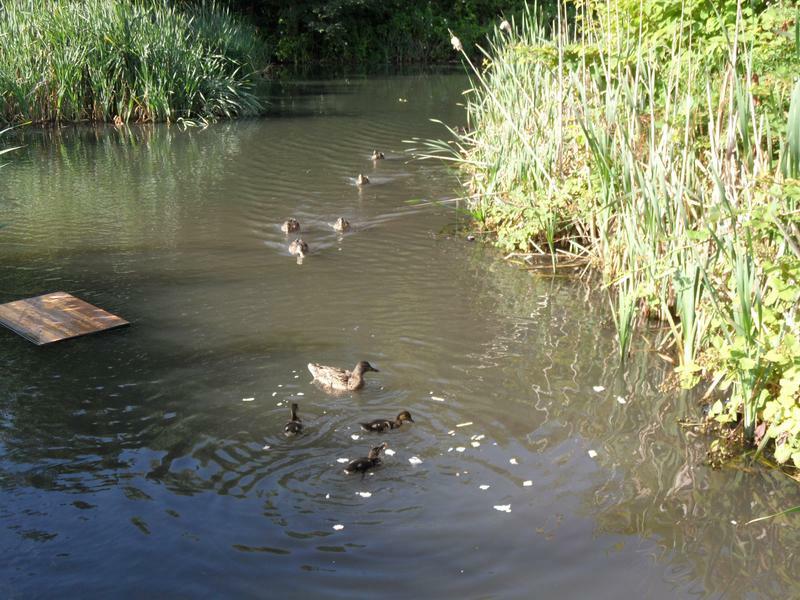 The ducklings being watched by mother and a Moorhen. 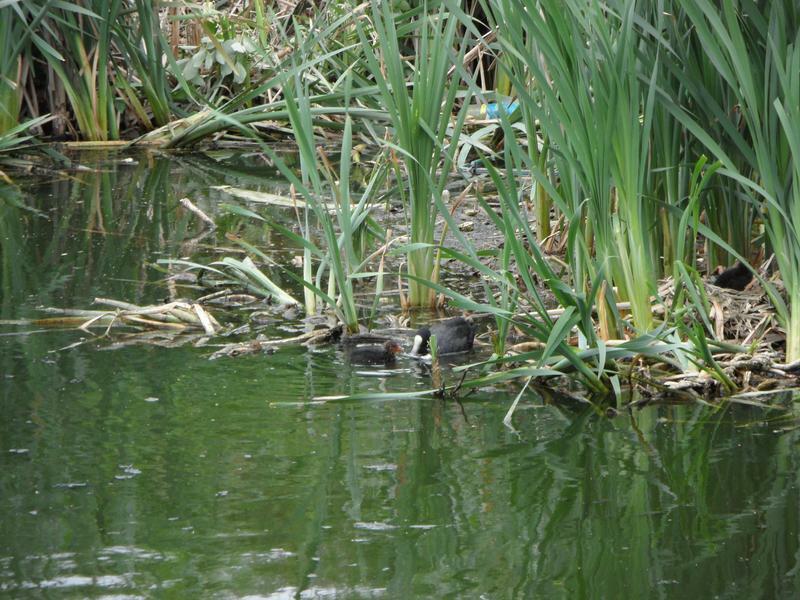 The fully grown first family sitting on collapsed reeds at the edge of the small pond. 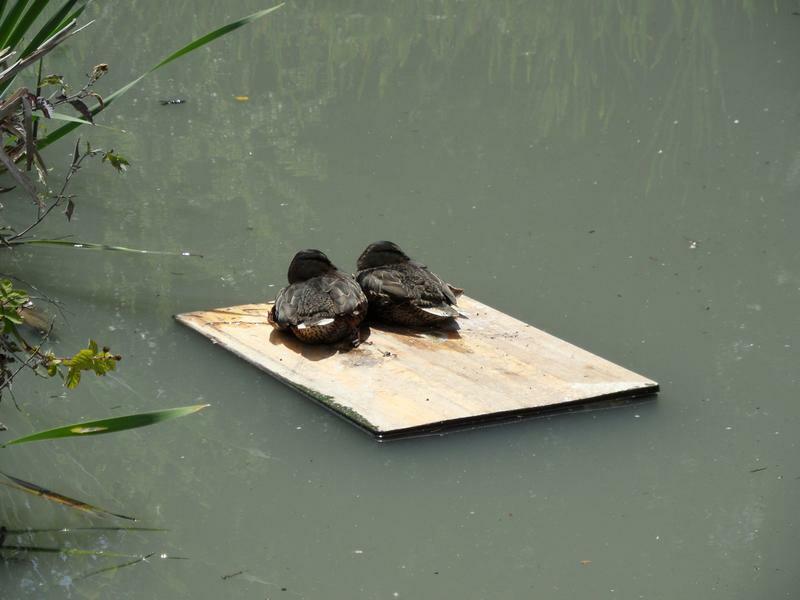 Two fully grown young ducks sleeping on some floating wood in the small pond. 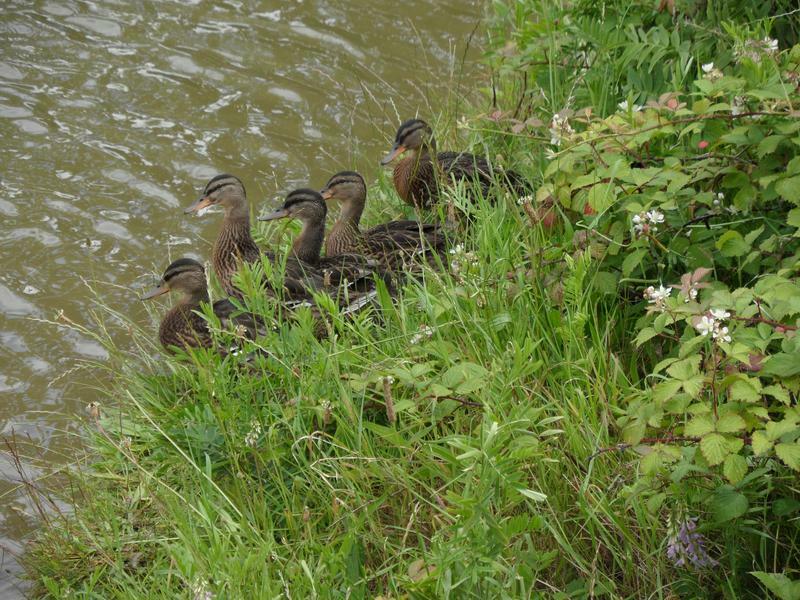 1st July 2011, the third Mallard family waiting for some food, probably two or three weeks now. 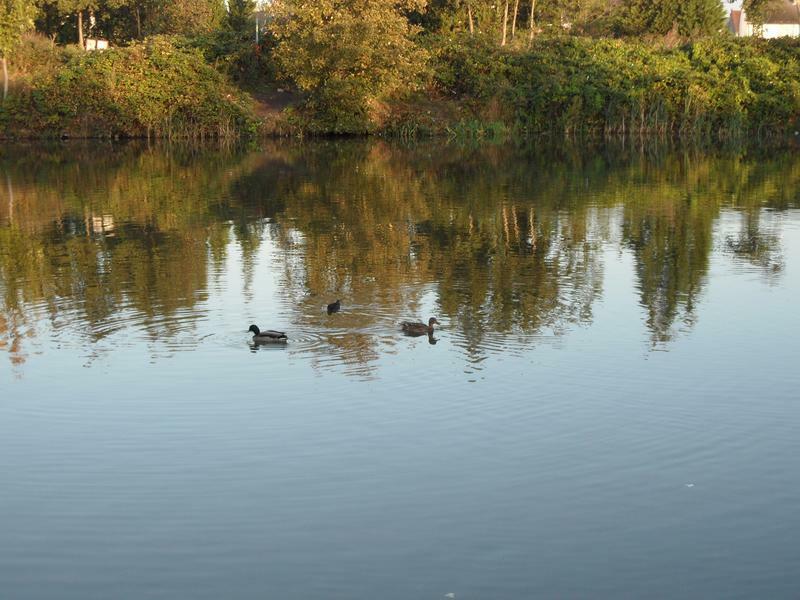 main pond. 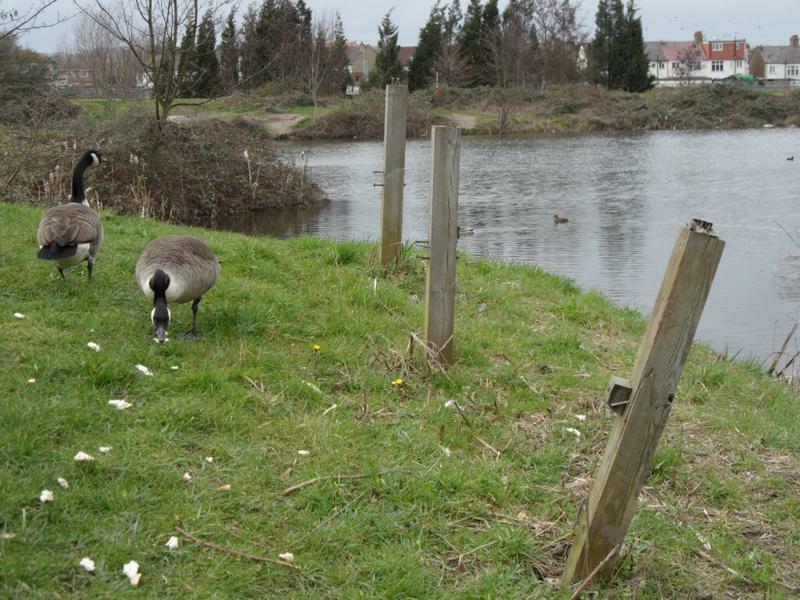 They are quite dozy, often taking a few minutes to notice that food has arrived. 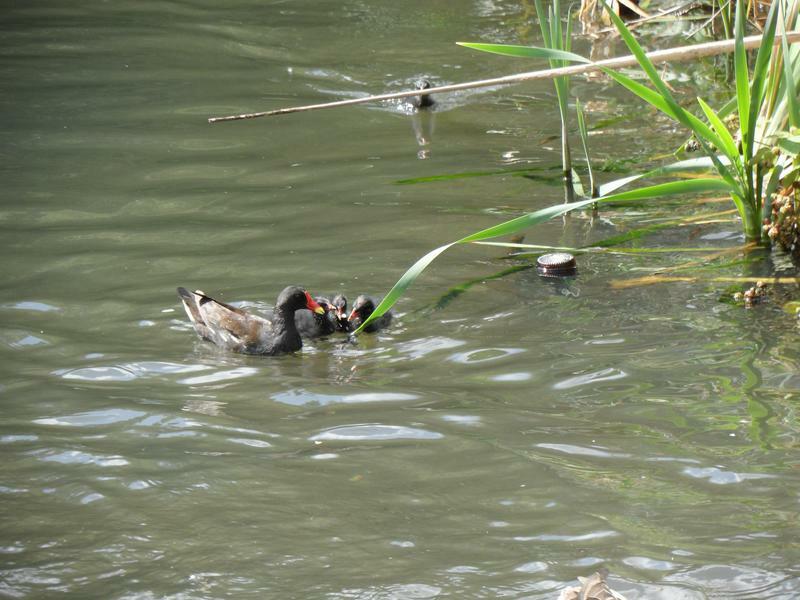 The Moorhen feeding a youngster. 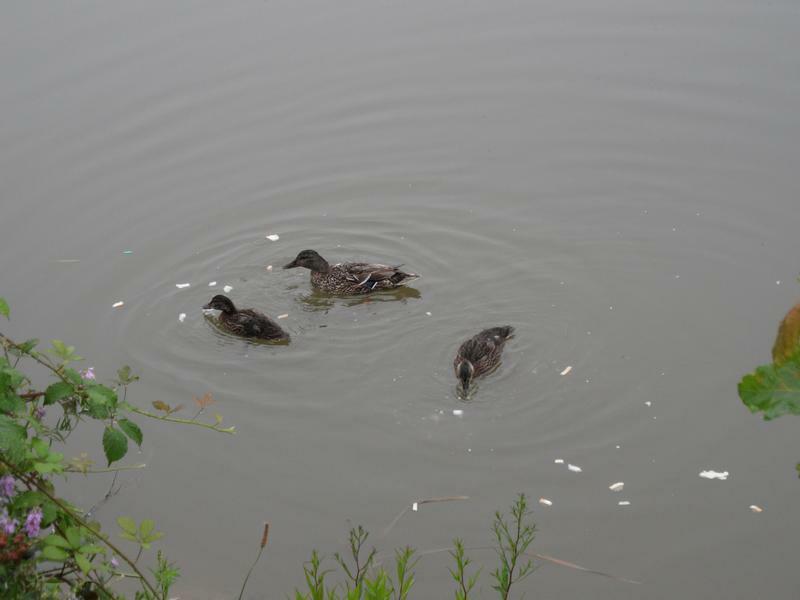 Two ducklings from the third family, with mother, probably about three weeks old. 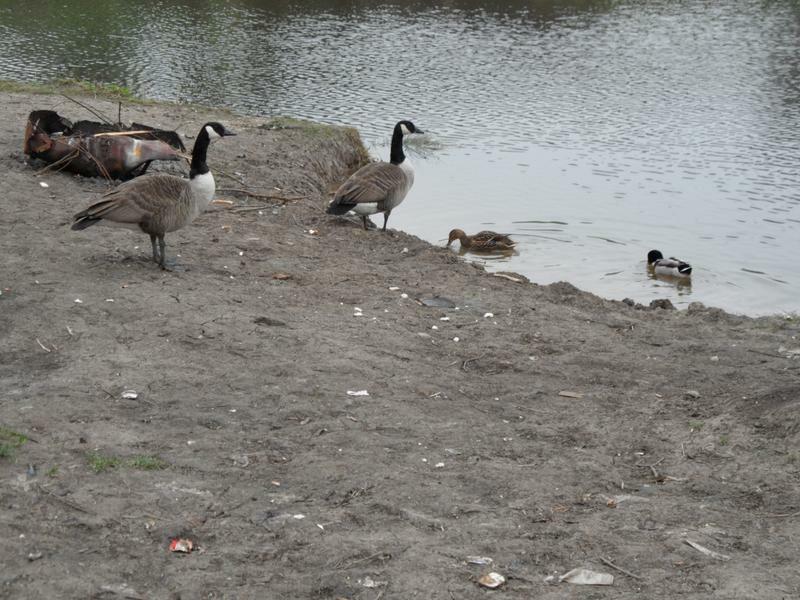 should be flying around now, and these were the last photos of this family at the meadow, they all flew away within the next week. 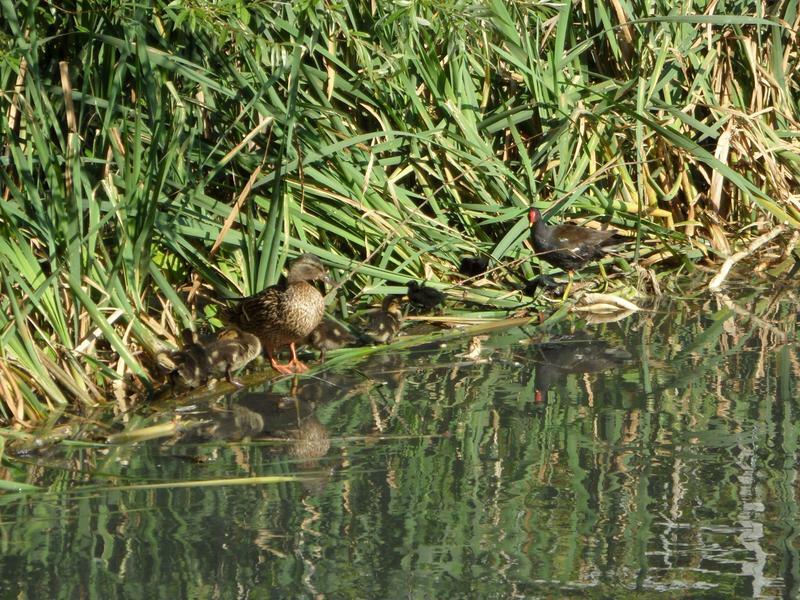 The Moorhen family, being fed by mother, although they seem large enough to look after themselves. 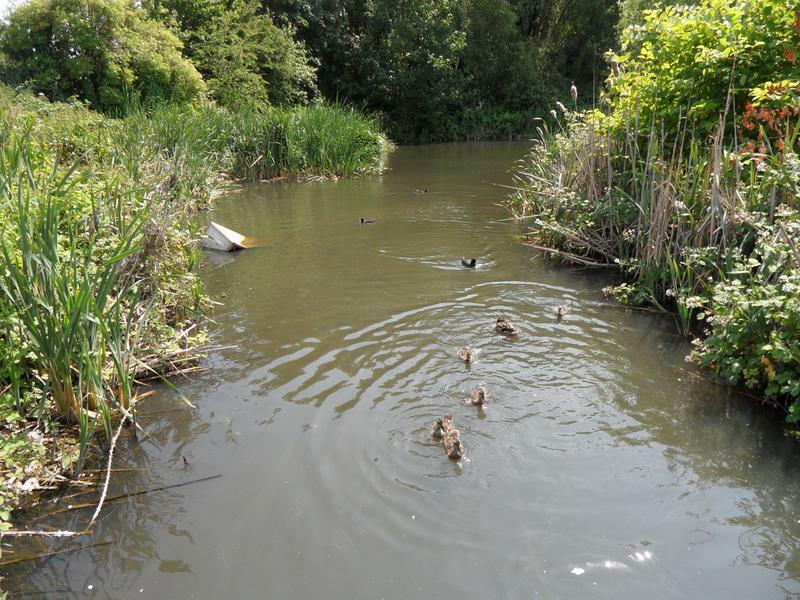 15th July 2011, only Moorhens and Coots on the small pond, but no longer hiding in the shallows, swimming around to feed themselves. 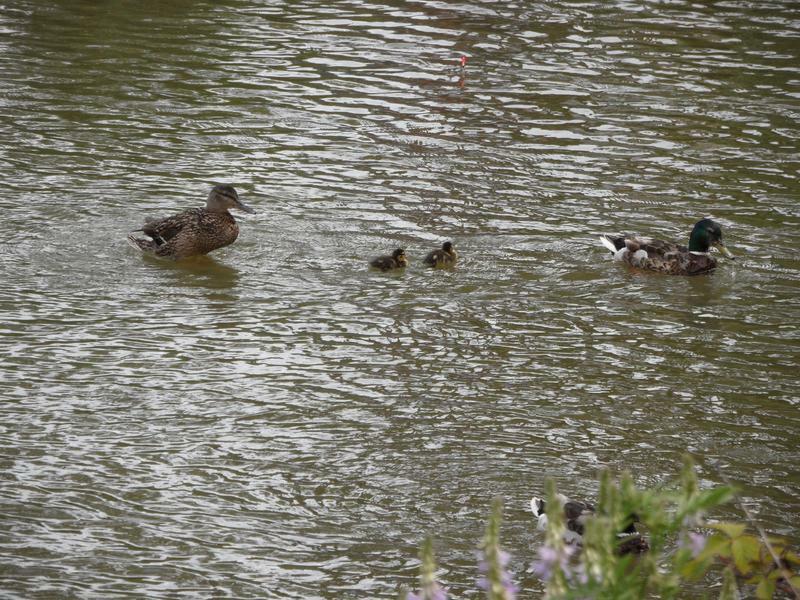 On the main pond, just one Mallard mother left with two ducklings, the original family has all flown away. 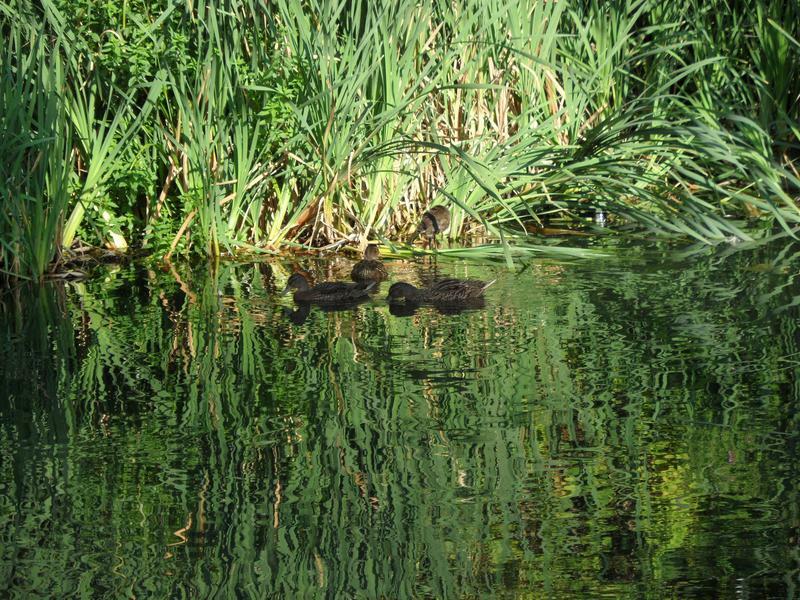 Mother on the water, with two ducklings on the bank. 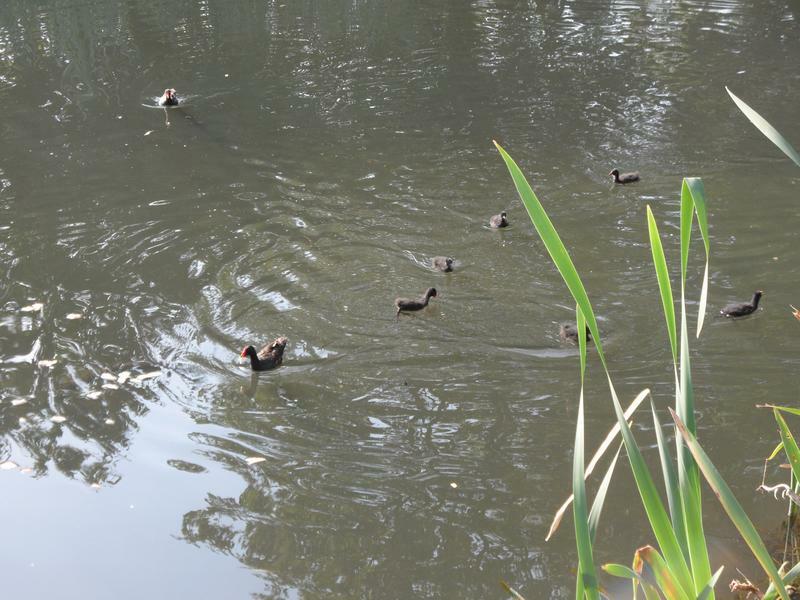 Back on the small pond, the Moorhens are thriving and still growing. 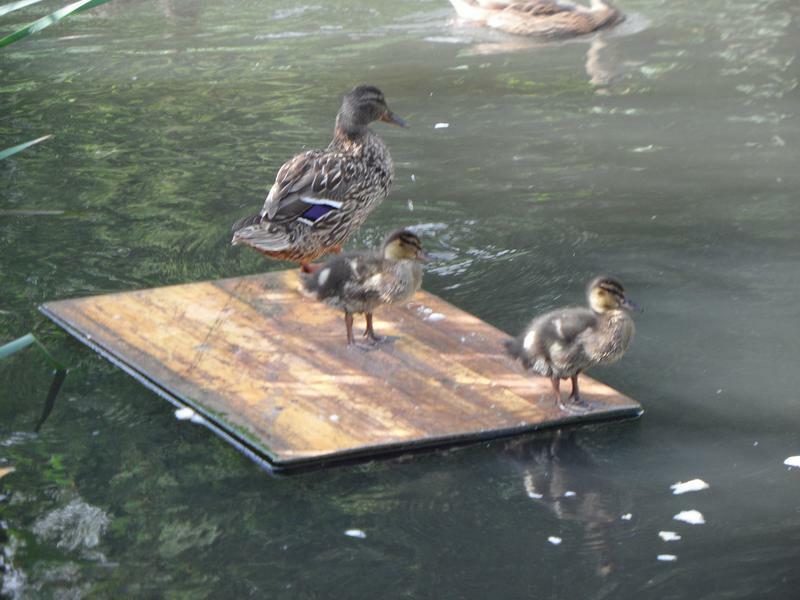 29th July 2011, the last Mallard family still not very hungry, on the main pond today. 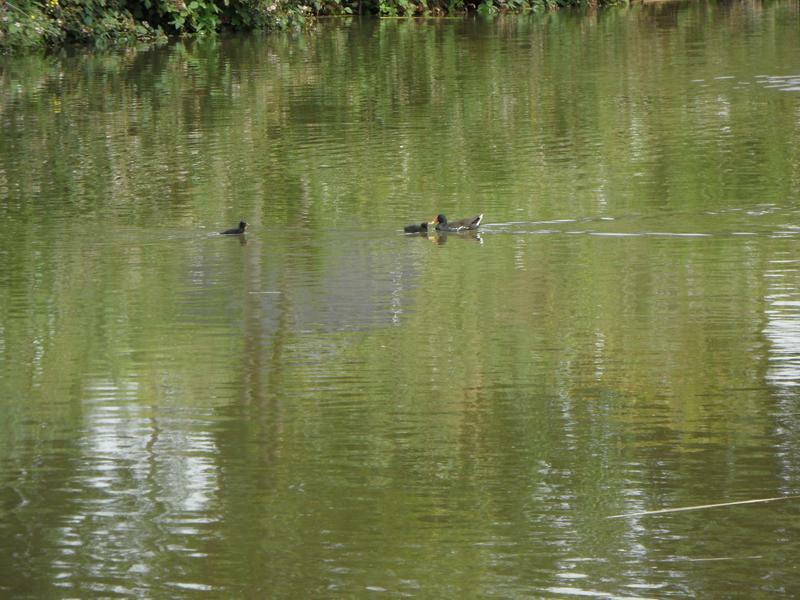 a rare appearance, lots of Coots and Moorhens still here. 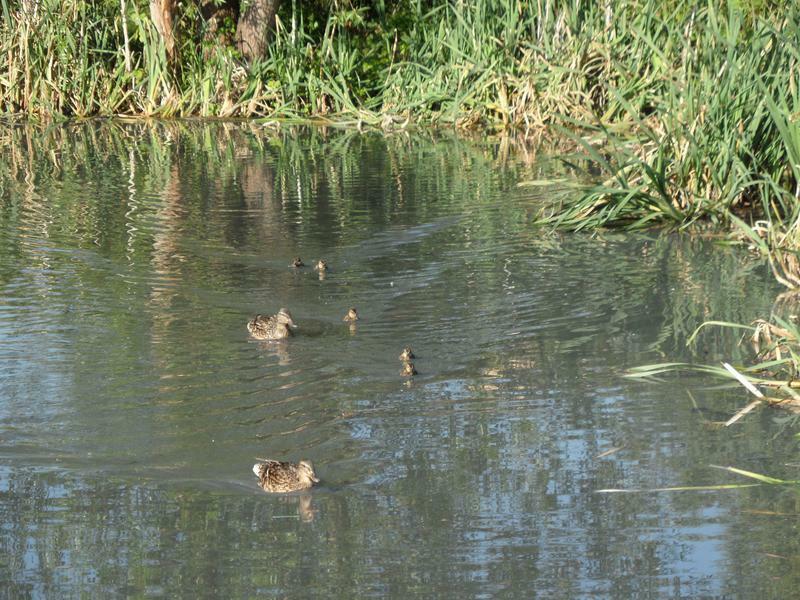 The Mallard family disappears back into the reeds. 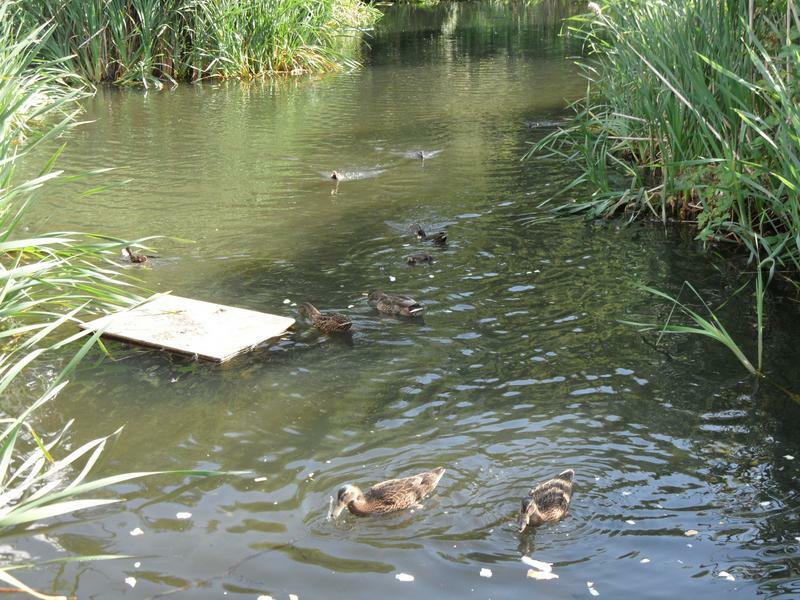 18th August 2011, another early morning visit and all the hungry ducks heading our way for food. 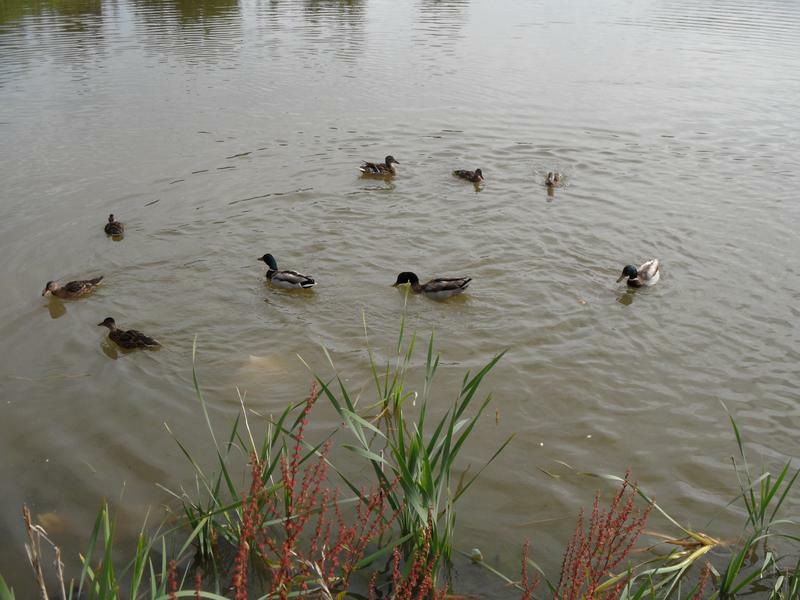 September 2011, all the mallard ducks have now left the meadow ponds, just a few moorhens left. 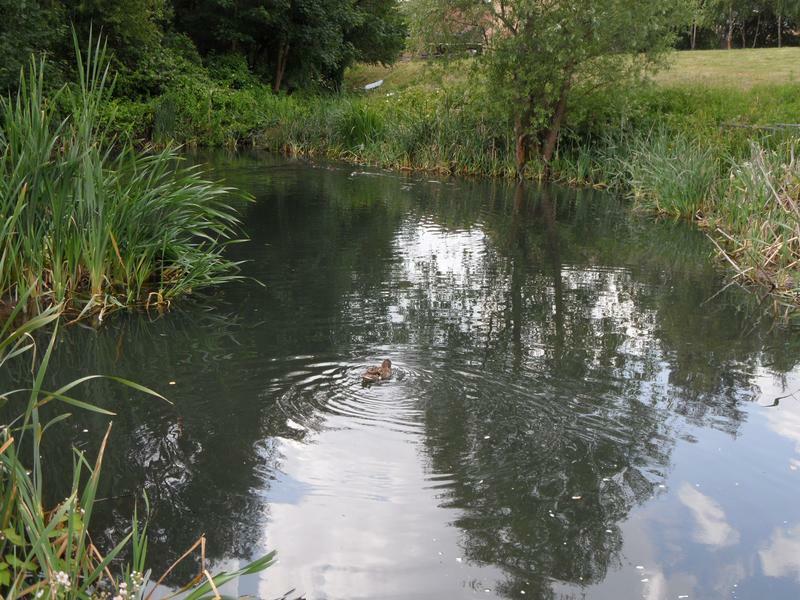 The small pond in the meadow, very quiet. 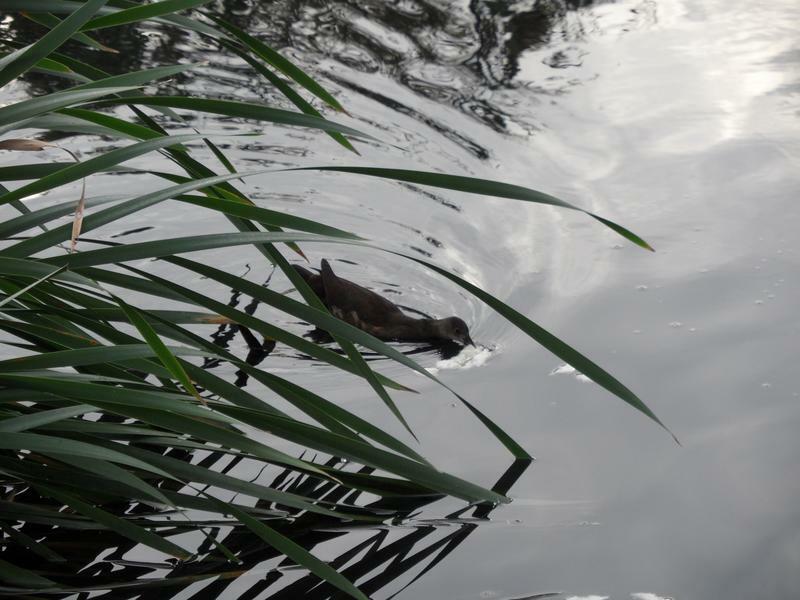 September 2011, a young moorhen on the small pond, possibly the second or third family this year. 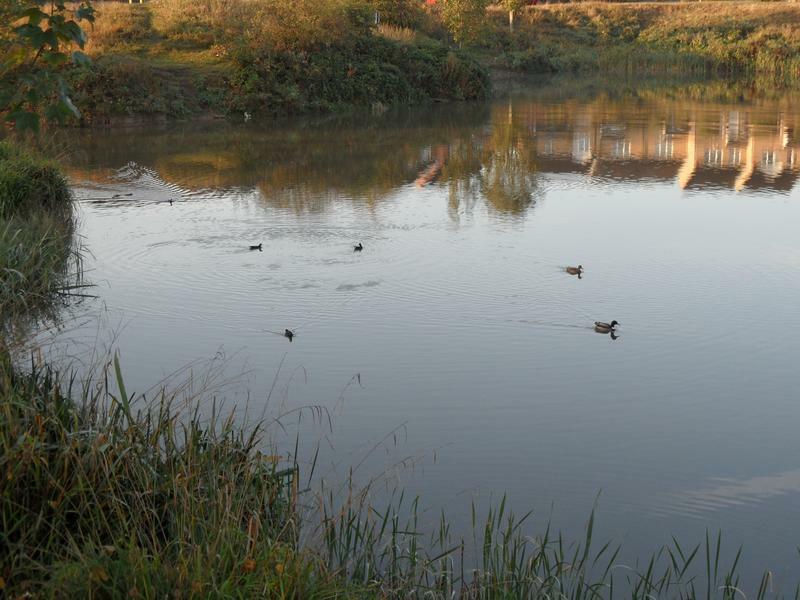 October 2011, there is one pair of Mallards on the main pond, although they flew off a few minutes later. 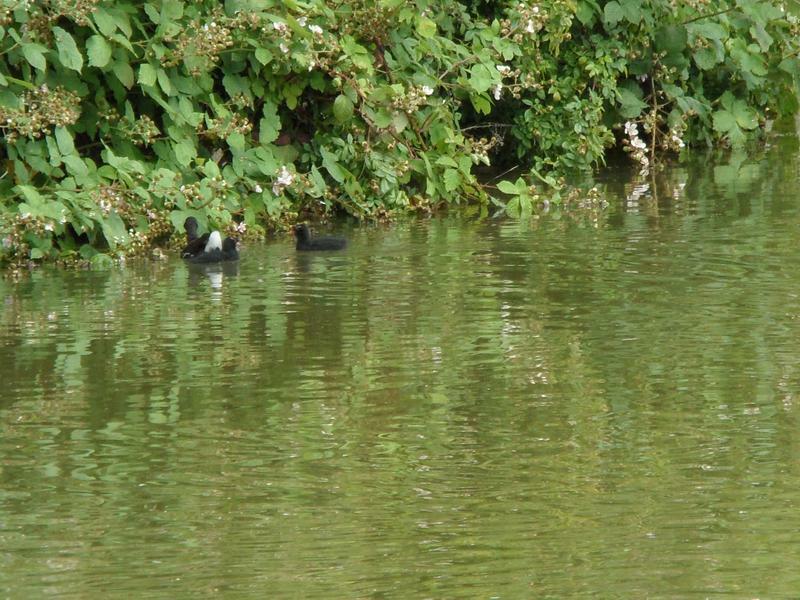 A Moorhen between them. 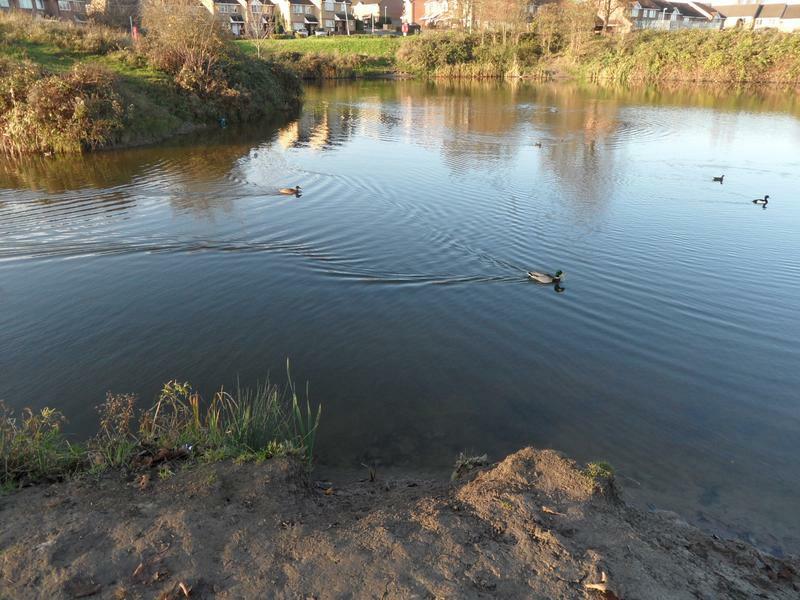 More Moorhens on the main pond, with the Mallard pair. 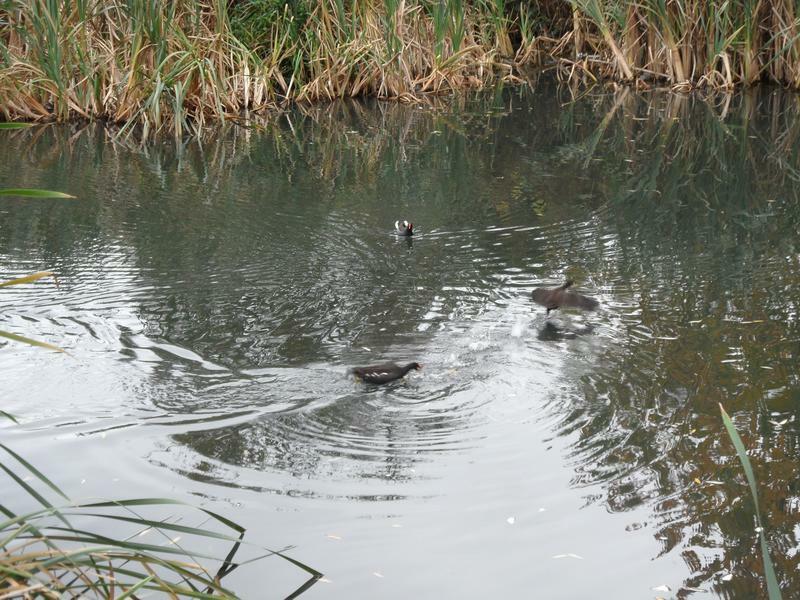 Several Moorhens on the small pond, very hungry. 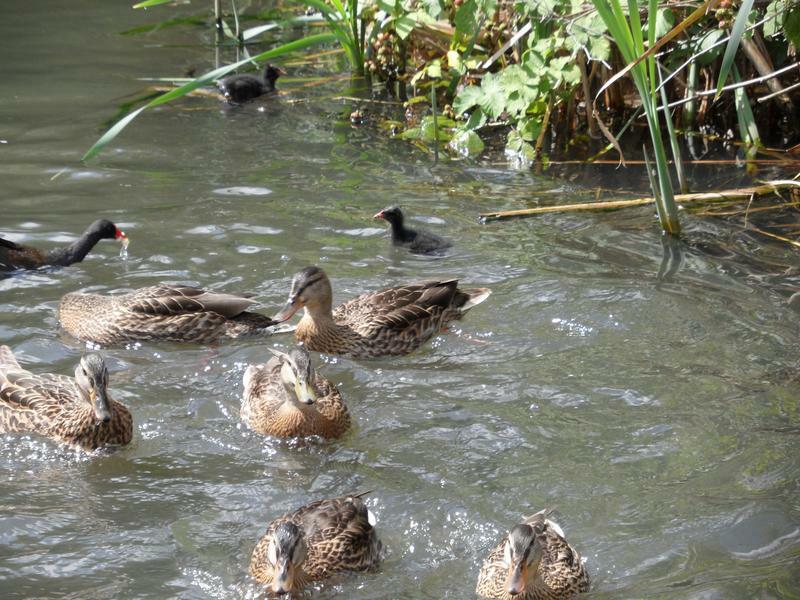 The Moorhens are chasing each other around the pond, with food. 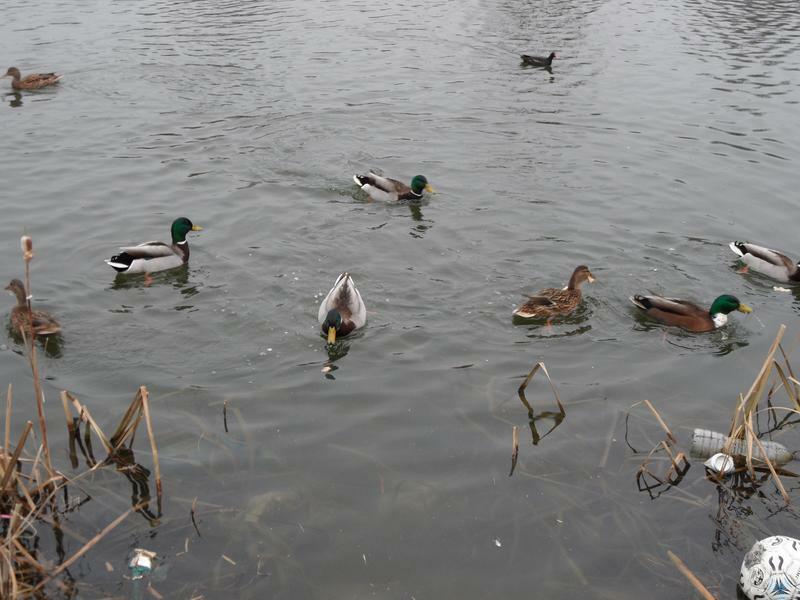 and no sea birds, perhaps lack of food. 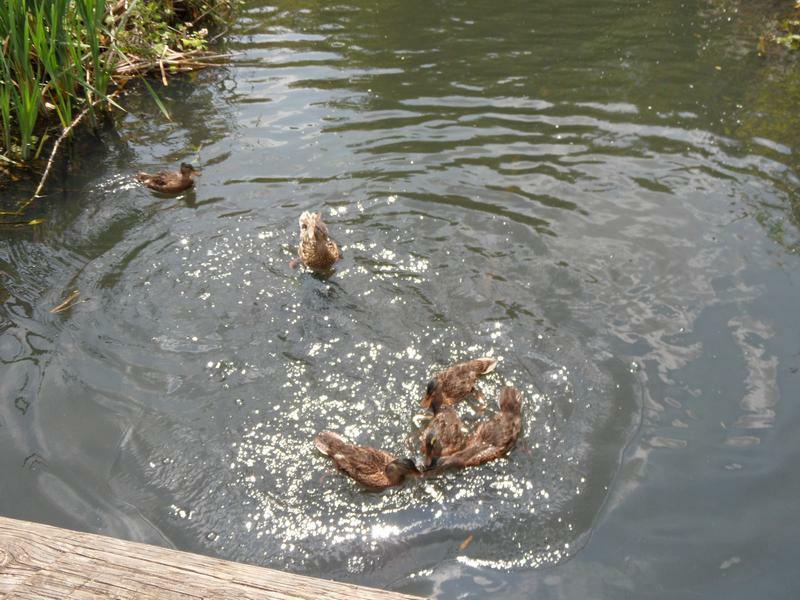 They don't seem desperately hungry, and only slowly swim towards the bread in the water, but it is all eaten. 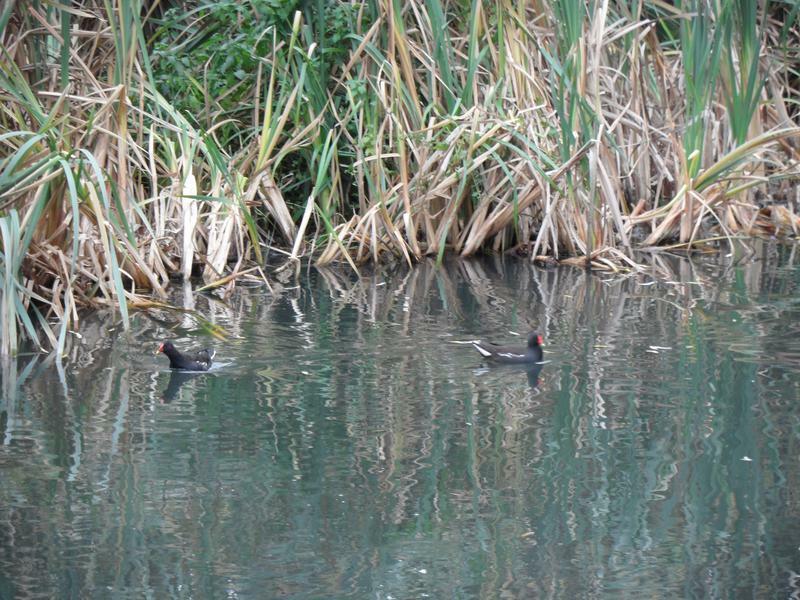 There are still several resident Moorhens on the two ponds. 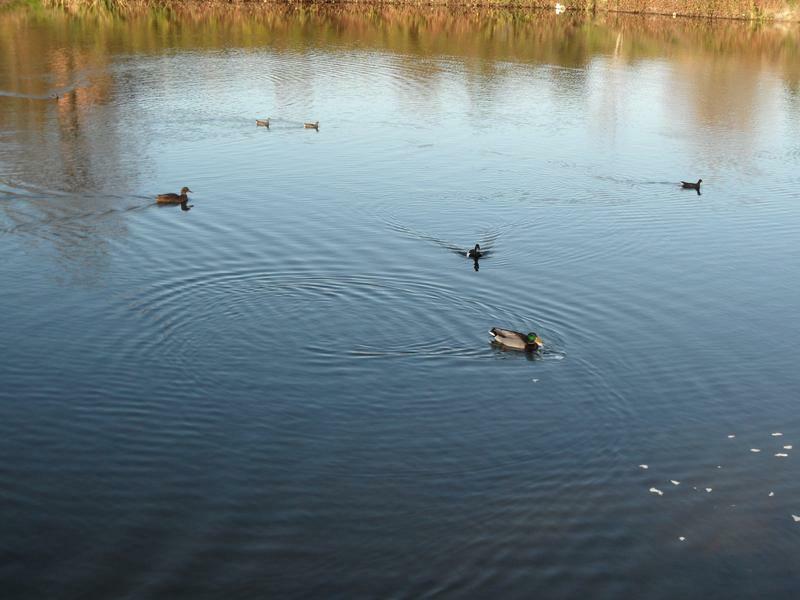 December 2011, just one pair of Mallards on the main pond. 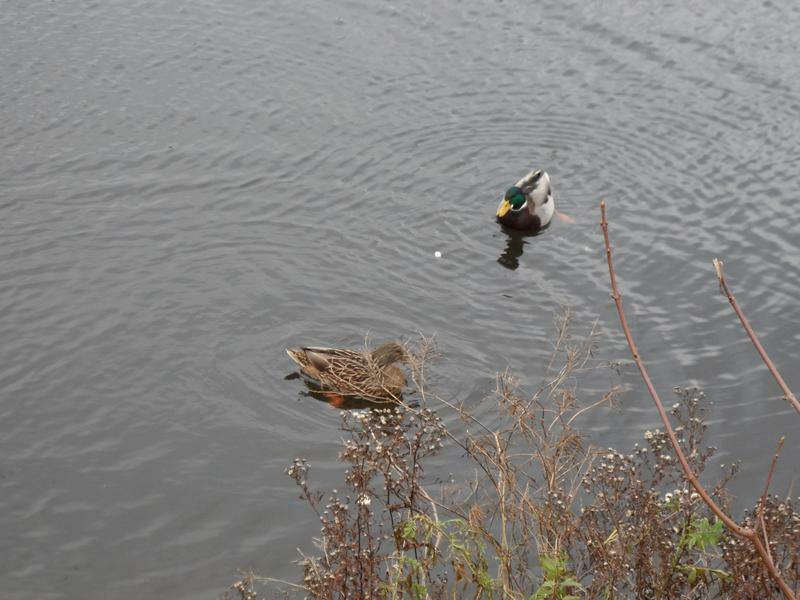 Christmas 2011, three pairs of Mallards this visit, these two hiding on the small pond, and did not move when I threw food in the water. 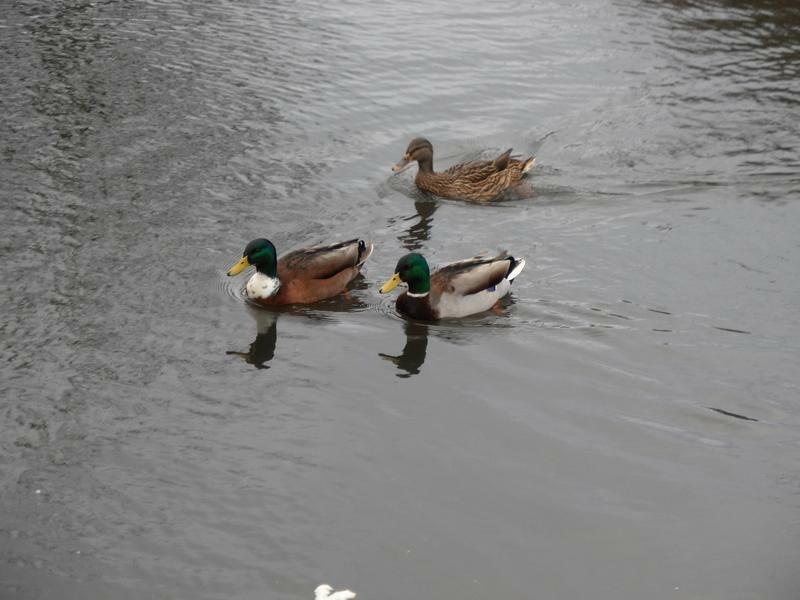 A second pair of Mallards on the man pond, with a second male, probably also a Mallard but unusual colouring. 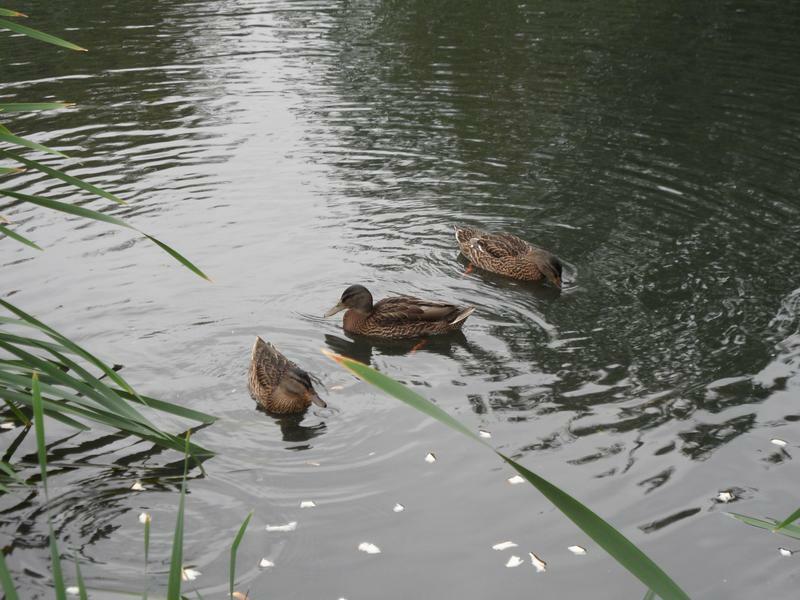 A third pair of Mallards near the stream between the two ponds.